There was a time when I moved from one secure place to somewhere else, as I have done now. There is a sepia photo of a small girl in a cage with white rabbits. 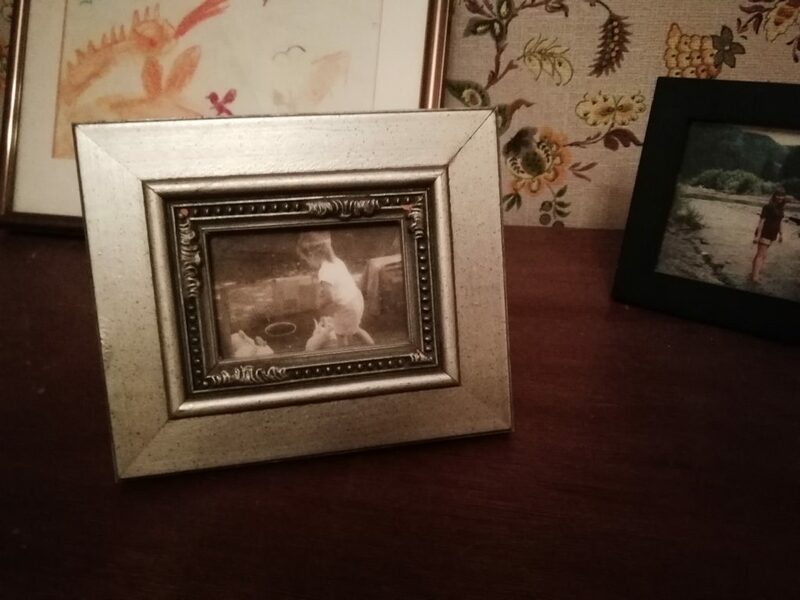 Sitting there in its frame in the living room of my last home and in some other familiar position in the house before, I assumed it was a moment my mother had captured at a petting zoo somewhere in my misty childhood. 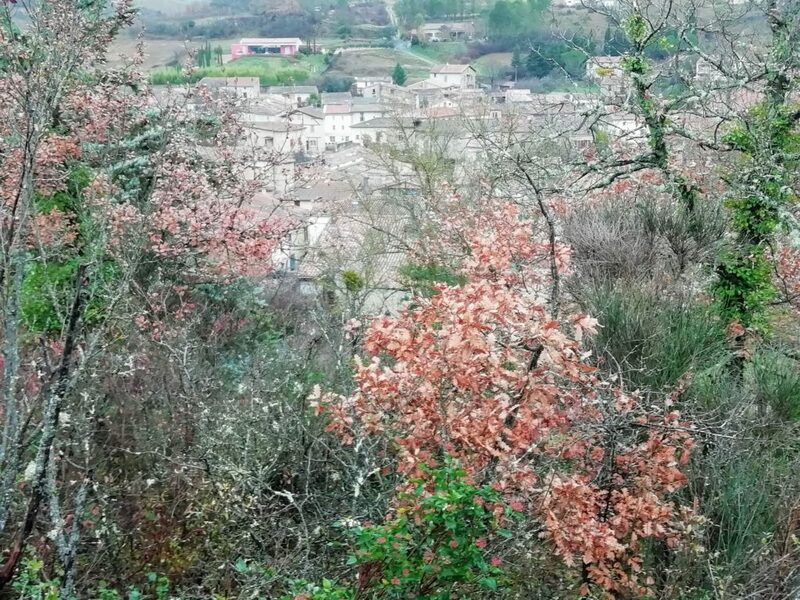 But this evening, as I looked at it again, in this new place, on the top of a dresser purchased at a second-hand store in Mirepoix, furniture now mine in a room in a partially settled house in Southern France, I recognized suddenly another reality. There I was, in my backyard in the first place we’d moved from Brooklyn. In our new town, I was five years old, tending the rabbits that were mine, that my parents had given me, in the pen my father had built for them there on the square of grass behind the duplex they’d rented on a nice old street in a nice old town. Now, as I recapture those images of childhood, I didn’t feel that small in the big world, that sweet and delicate. In my memory of the rabbits, I was a person of consciousness, of large awareness–of rabbits, of a body of some magnitude navigating tree-lined streets on a tricycle, of other people in my world, of great imaginations. In the photo, I am as little as my granddaughter. She will remember herself as a person of agency, just as I remember. She will remember conversations she has had with friends. She will remember herself in those dream-like memories as a real person in interaction with the world. She will know who she was. Here I am, back in France, in France, in France. Anywhere. Everywhere. It’s clear we are all experiencing the same waves. We are in the same ocean. For several days after we arrived, the afternoons were warm and even sunny. 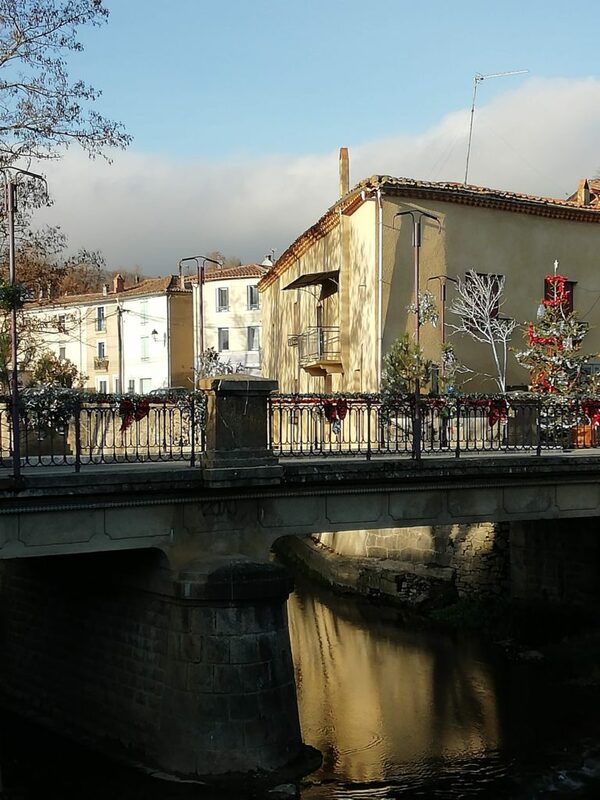 We sat in an outdoor cafe in the village of St. Jean de Verge one late afternoon sipping Kronenbourg beers, watching local people at the other tables chatting and relaxing at the end of their workday. The little square was decorated with white lights in the shapes of swans and Sapins de Noël ready to spring to life after dark. The Gilets Jaunes were on the roundabouts in the bigger towns, stopping traffic periodically, gathering around bonfires made from stacks of recycled pallets. The burning bonfires, the destruction in Paris make visible the burning resentment of those who have little towards those who hoard the wealth at the top–so ironically modern while so ancient just as is the xenophobia manipulated by synical leaders. It was a relief to be out of the stress and noise of the US. 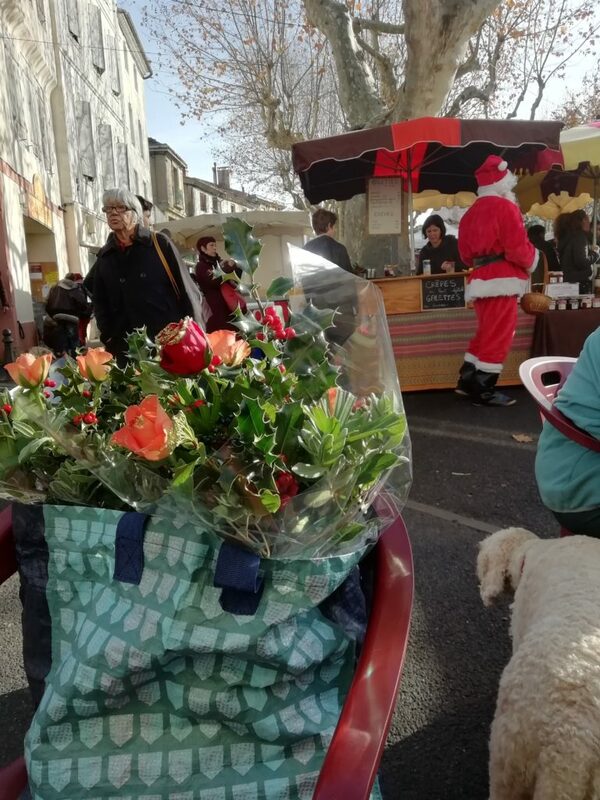 Even the political chaos of Brexit and the rampages of the Gilets Jaunes seem calm. 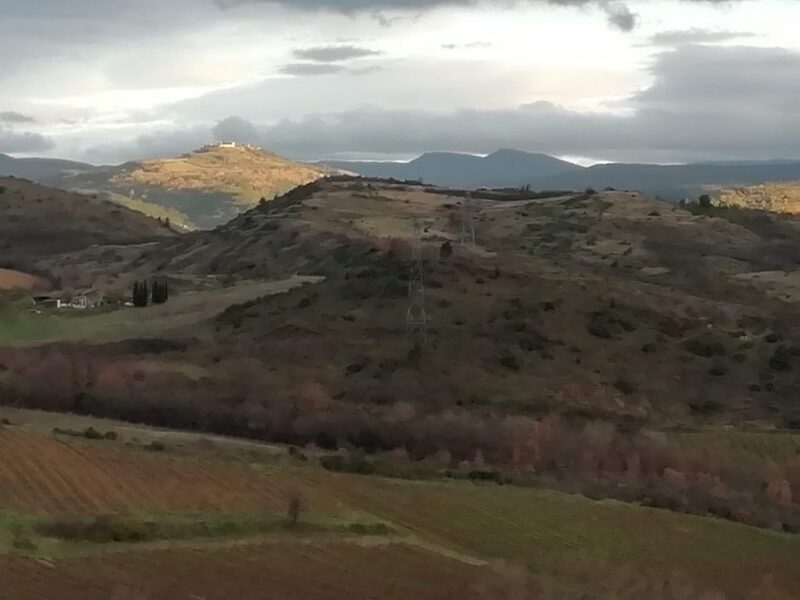 Now here we are, back in Fa, the village that came to feel a bit like home this past summer, at the rambling old house of our British friend, with the tower of FA in its backyard, its tiled patio still catching the afternoon sun, its warmth now brief. Today in the misty rain I hiked up into the hills behind the village where the ruins of the ancient village of Fa once spread itself around a protecting little castle. My last hike up the same hill was in humid 32 C degree heat, dressed in a flowered sundress and straw hat I’d bought at the Sunday market. Now I wore the same woollens and Gortex jacket I’d worn on my endless walks over the Yorkshire Dales in the chilly rains of August. 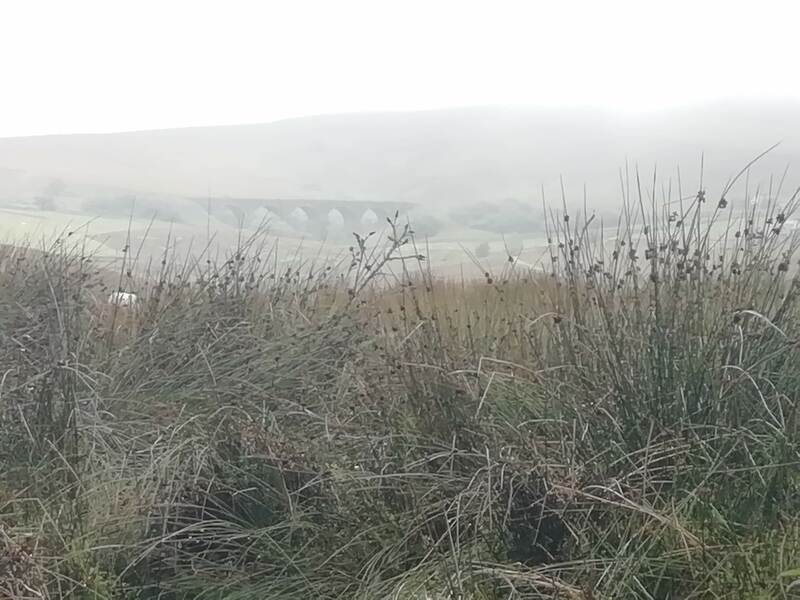 The landscape, in fact, felt much the same, the rolling hills, the views over extended valleys, the dry stone walls, the muddy tracks, the puddles of water, the steady light rain, even the gusts of wind on top of the pass above the old tower. 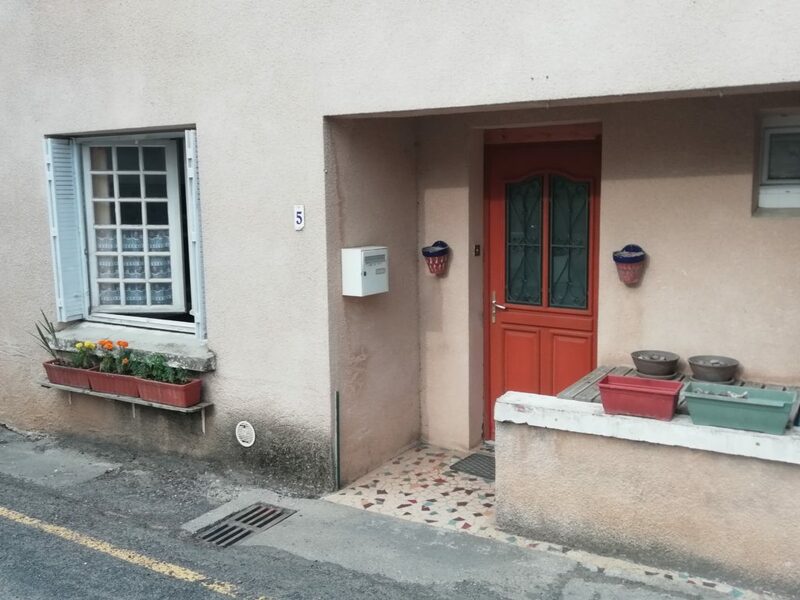 We’re back in France to face all the practicalities of starting a home in a new culture, with new rules, new ways of approaching the tasks of life. Because we’ll be living in a rural area in a small village without public transport to speak of, we’ll have to buy a car, deal with car insurance and then, eventually, with the whole loathsome process of getting a French drivers license. We have to figure out the best places to buy all our household goods like mattresses, stoves, refrigerators, pots and pans, dishes, linens and on and on. There are great second-hand markets and decent online marketplaces. There are networks of friends to ask. And there’s life to live. Endless walks to take. Castles and caves to see. Other areas of France to visit. A rhythm to settle. A new way of life that contains selves that are at once fluid and contained, familiar and new. Today, I saw two things that particularly mixed the soup of self the way only a jolt of joy can do. This time it was two things that link together strangely, both revelations of the quirky imagination that lurks everywhere, in all ages of humankind, in all places we live and move. The first was such a simple thing. It had such brilliant elegance in its practical ingenuity. I watched as a friend from Australia casually put the heel of his “gumboot” in the rounded slot carved out at one end of a short painted board. He put the toe of his other foot on the bottom end of the levered board and pressed. His boot with the trapped heel came off nicely. He pulled his foot gracefully out of the boot, stuck the other boot heel in the slot, pushing down on the clean part of the bottom of the board with his stocking foot. Pop! Off came the other heel, easy as can be. And I, having lived in the rain and mud of several parts of the US had struggled for years to pull off my muddy, clunky rubber boots, using the outer edge of the door jamb or resorting to a friend to help. Here it was, so easily solved. 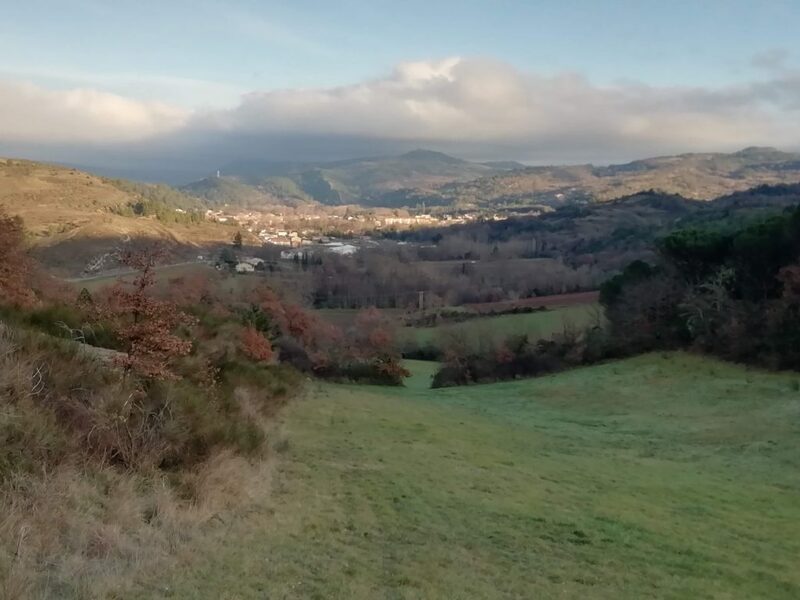 Then, walking up the hill past the village cemetery where only long-time residents of Fa may be buried, I happened on a small piece of land nestled into the side of a hill. First I saw the wooden shack with tarps of various colors for a roof and salvaged window panes stuck in here and there on one end of the small holding. Then the small camping caravan appeared (what we call a trailer in the States) and then I saw the new construction. A large pair of beautiful wooden gates, clearly newly made, each more than 15 feet tall, stood at the entrance to the land as if to keep people from trespassing up the drive of an elegant country estate. The beginnings of a beautiful wooden cupola could be seen at the back of what might be the beginnings of a landscaped island of garden. In the chill of the late afternoon, the whole thing looked empty of life. If you live in the same place for a long time, the relationship to what we know as our “self” becomes more rigid and fixed. We think of our self in relation to all that comprises a life. With seismic shifts come the chance to experience the huge reality of self—the reality of self before it has the chance to pretend it actually is what its surroundings urge it to be—to experience the huge reality of the interior before it gets the idea of a new form, new edges. That self is now naive—it has yet no fixed belief about what it is, what it sees, what it hears, what it smells, what emotions turn up. It exists without the heavy anchor of habit for some brief wafting moment. In the process of being seduced, the self is more like someone in the bloom of love, open, infinite. The world now echoes and reverberates. The anxieties of the US seep into the anxieties of the French. The distress of the people on the bottom is beginning to break free. We are pivoting. We are all travellers, travelling through a particular life in a particular time. See like a traveller. Be open to possibility like a traveller. Hear the people around you like a traveller. They are travellers too. When I’m walking I’m happy. Even if I’m feeling miserable, I can feel the misery full on, I can have a talk with it. It can do its real work. 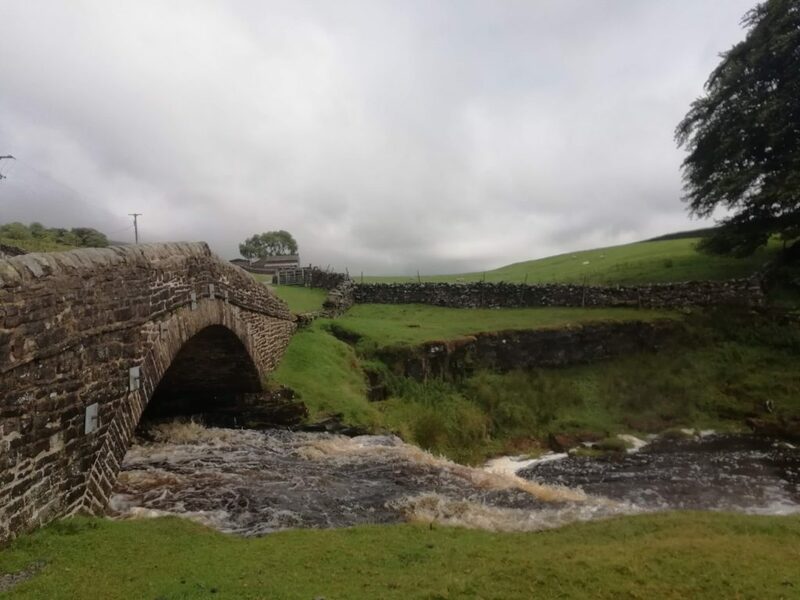 This morning in Garsdale it was clear enough to hang out the wash. By one o’clock the rain had returned and the laundry had to be brought in to finish drying by the heater. But even with the rain coming down, the weather is much more tame than yesterday’s when we were walking across the fells from the village of Malham near Settle, winds of sixty miles an hour or so driving rain and hail across the moors, sheep standing in depressions near the drystone walls to ride it out. The walk to Malham the day before had been wonderful. Despite predictions of rain all day, the rain came in bits and the sun came in and out, the wind gentle, driving the clouds in their various forms and shades of grey, cloud shadows running across the spectacular vistas of hills and dales with their craggy limestone cliffs and outcroppings, over miles of vast green squares marked off by miles of drystone fences, white and grey and brownish. The rain pants we’d bought that morning kept us dry in the wet spells. 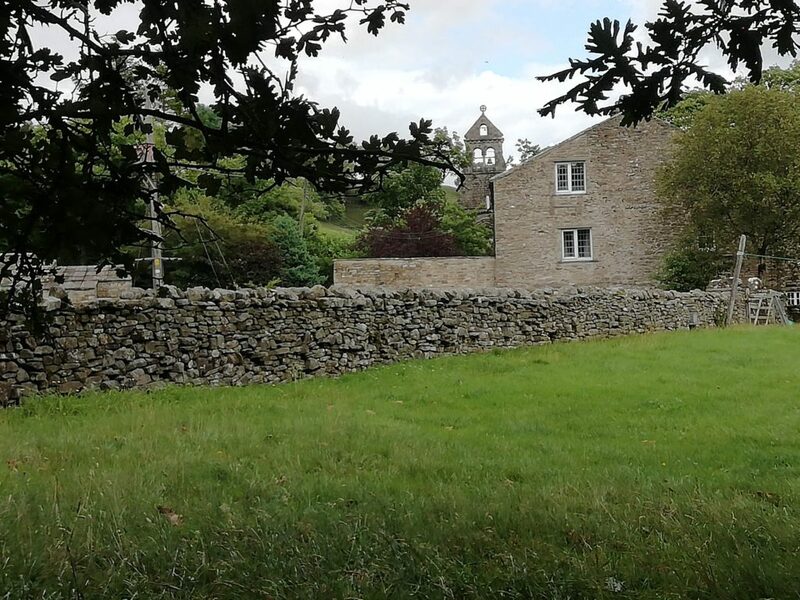 Some of the territory was familiar from a walk a week before from Settle–satisfying to recognize a tree, a style, a stretch of re-forested land, a lane, a farm, a turning. Just before reaching Malham, as we made the choice to take the footpath rather than the Pennine Bridleway, my spirits were high, my heart particularly open. 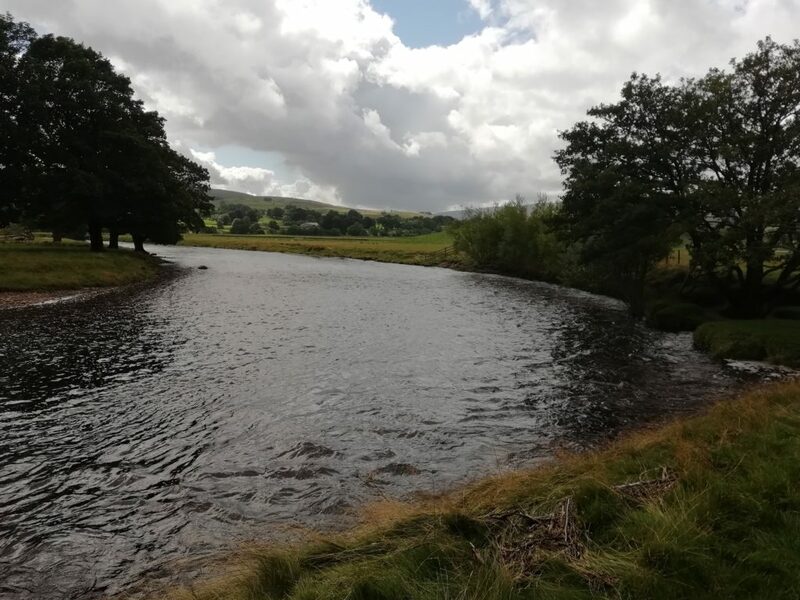 We had just spotted the beautiful oval shape of the water of the Malham Tarn, as lovely as any lake, I’m sure, that I haven’t yet had a chance to see in the Lake District. The sight of it had lifted me further. Checking the map together, a bit tired, we had a bristly moment of interaction. On the trek down the hill to the village hidden by trees in the bottom of the cup of the wide valley, I had the time to walk with the dis-ease that had suddenly surged up in me, feeling it molded by the effort required to find footfalls through rocks and mud on our downhill climb, softened by the vast beauty of the surrounding hills and cliffs. This is the beauty of walking. It took a while to make out the actual buildings of Malham, nestled as they are in the greenery by the stream of the Malham Beck. 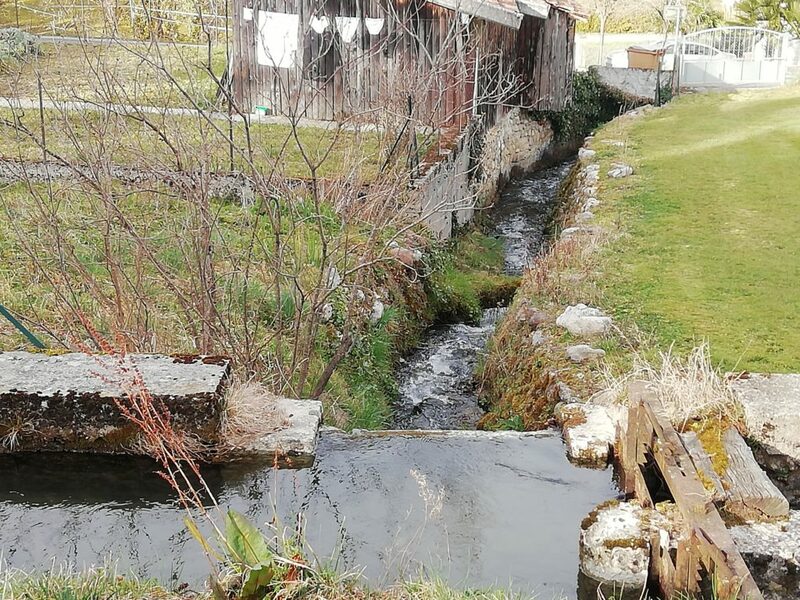 By the time we were close enough to recognize the charm of its setting, the beauty of the stone houses with flowered gardens, the trees bending over the trickling water, I had digested the pain of the emotion enough to understand its origin. We would soon be leaving this countryside, this place where we had come to feel settled for a time. We would be leaving Europe and returning to the US to grapple with the difficulties of immigration, both technical and emotional. Upheaval. Like the motion of the tectonic plates creating the landscape. Ah, yes… My old friend that rumples me, always. 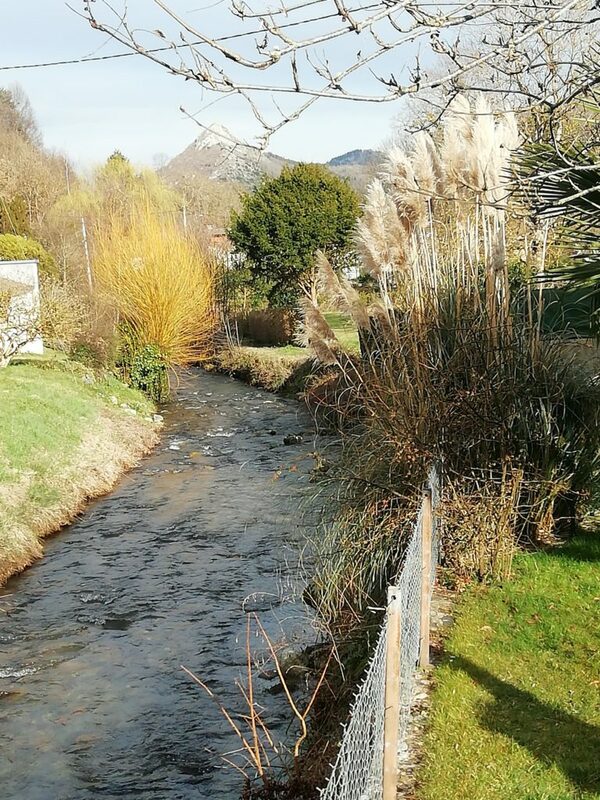 Thirsting for a British beer, one of our last, we headed directly for the inn overlooking the beck, the one over the stone bridge where a willow leans over the bank. It was warm enough to sit outside by the stream, drinking Bitter (which is actually creamy and smooth), feeling luxurious, enjoying the hum of our bodies after their exertions, drinking in the beauty all around us, surprised by the sight of tourists gathered in this isolated spot. The distress that still smoldered was cooling, no longer needing to sear to do its work. After we checked into the hostel down the road and had a rest in our bunks, we came back for a lovely dinner at the same inn by the water. Checking our weather apps, we discovered that severe weather was predicted for the next day, our walk back to Settle. A big storm Ali, the first of the season, was blowing across the northern part of the islands from the tropics. Eighty-mile-an-hour winds were forecast. Big rain. No one in the village seemed the least concerned. We went to bed and slept well, dreaming the many dreams as we do every night here in the quiet and calm of the Yorkshire Dales. 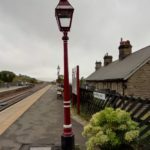 We agreed to wake up and decide then whether to continue our walk or take the one bus a day from the village to the train station at Skipton. We figured we’d walk if the morning looked at all decent. It dawned warmish, breezy, grey and dry. 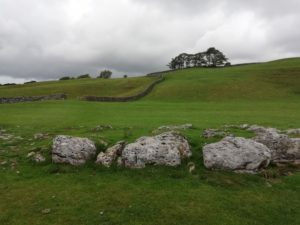 We had our breakfast and picked up the packed lunch we’d asked for and set out on the “top” part of the circle walk back to Settle through Malham Cove. Why not try it. 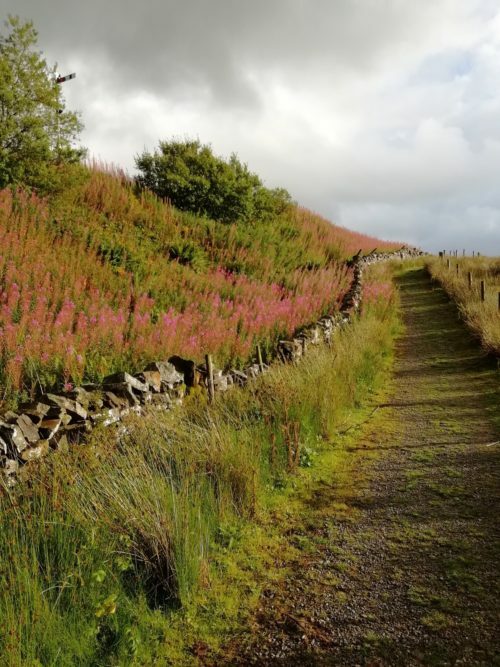 As we started out, I had no conception of the beauty we would see in the walk through the cove, nor the wildness of making our way over the high moors in high weather. We watched as a large group of walkers started out over the first part of their walk, evidently prepared, as we were, for anything. The walk away from the village gives a deeper sense of why it has settled into its nest there in the cup. There it is protected by the trees gathered around the water, sheltered by cliffs and hills at the edges of the bowl. Having had a life there for so long, raising its sheep and cows, mining its limestone, it has blended into its landscape with the sigh of a weary body sinking into a cosy bed. 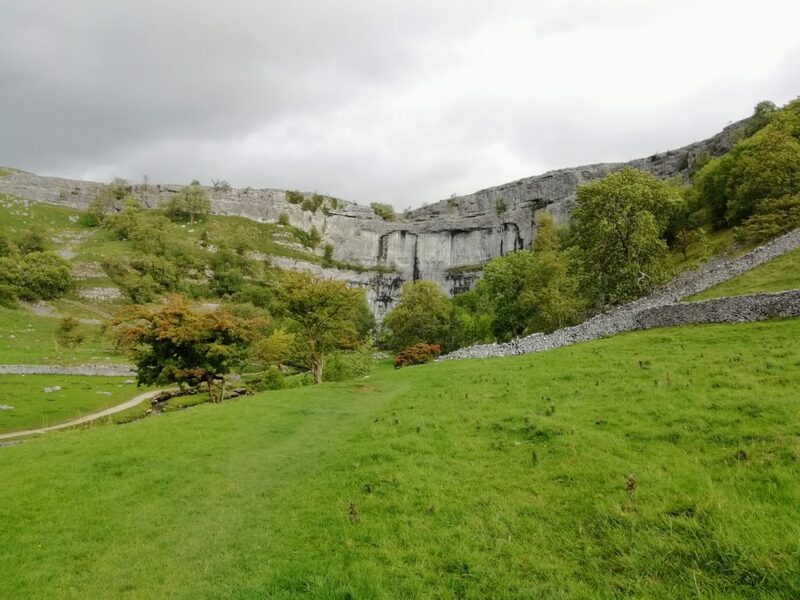 So nearby, less than a mile of walking over the Pennine Way through lanes and then fields, the limestone cliffs that surround Malham Cove begin to rise up. Just there, dwarfed as you feel, you can see how the little river flows directly into the parting of the rocks. Around the cove, the land becomes a park of green grass, oak and rowan trees, dotted with limestone rocks of all sizes, looking tended yet wild. For awhile we explored the deep canyon and the waterfalls seeping between the feet of the high limestone cliffs. 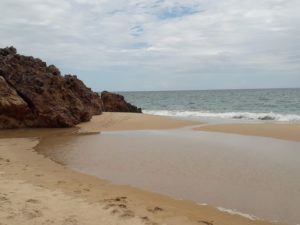 Eventually, we found the bridge of field stone slabs that takes you over the swollen stream to start the climb up the huge rocks of the other side of the cove. The way is made easier by a seemingly unending flight of huge limestone steps that wind their way along the side of the rocks, their scale like something made for a race of primordial giants, each turning presenting yet more shifting pictures of the widely winding valleys and softly rising hills. Winded, we paused several times to breathe it in. And then, unanticipated, not indicated on our map, one or two last turnings before the true top of the fells, we came upon the stretch of enormous, flat limestone rocks called a Limestone Floor. Protected from the wind and rain and foraging sheep, rare plants grow in the narrow crevices between these gigantic slabs. The sheer expanse and flatness of it, spreading towards the cliff edges and the horizon, gives a sense of the infinite. We walked from rock to rock for a bit to see more of what lay ahead, but the going was precarious enough to better be left for younger legs. The weather was holding as we climbed over one rise after another and came to the turnoff to Malham Tarn around a limestone outcropping. A couple whose path had converged with ours turned that way in the building wind. 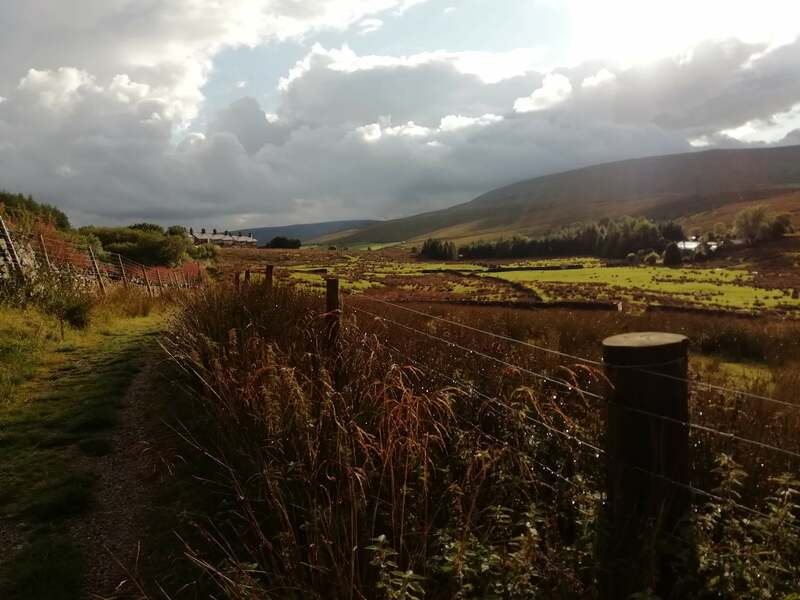 We kept on across the fields to follow the Pennine Way back to Settle, saving the trip to the lake for another day. So much of what we do now contains the piquant sense of a last experience of the place, greeting and parting at once. With places like these, I at least like to pretend I will return. There is so much more. As we took the left and began crossing the next field to the gate over a road, the rain began. 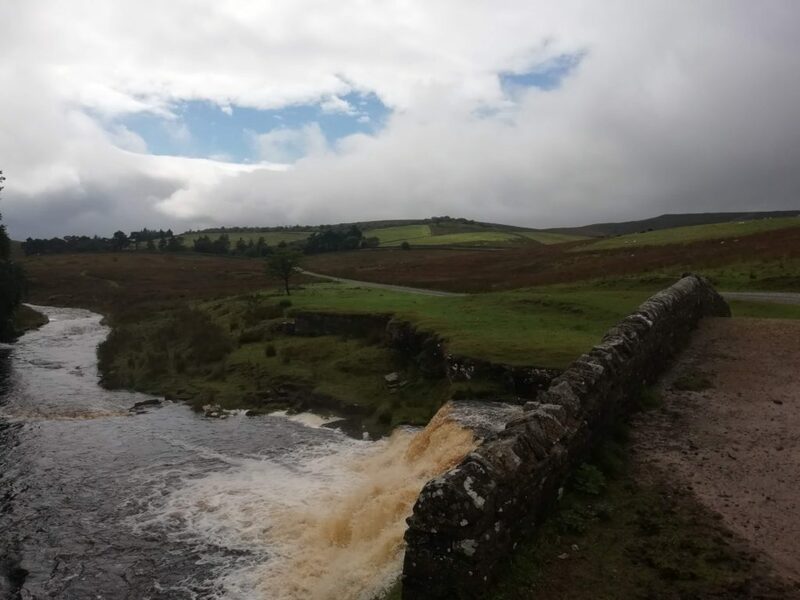 After climbing the first hill up to the high plateau of the moors, the wind was beginning to push the rain it in its characteristic gusts across the fields. Time to stop and put on rain pants before we got truly wet. We took off sweaty shirts and put on a couple of warm layers. The best would have been wool next to the skin but I at least had a good mohair sweater to put on top of a dry shirt and Walter a fleece. As we tightened our boots and pulled on our wool hats, the wind was beginning to gust with real strength and the rain had started in earnest. 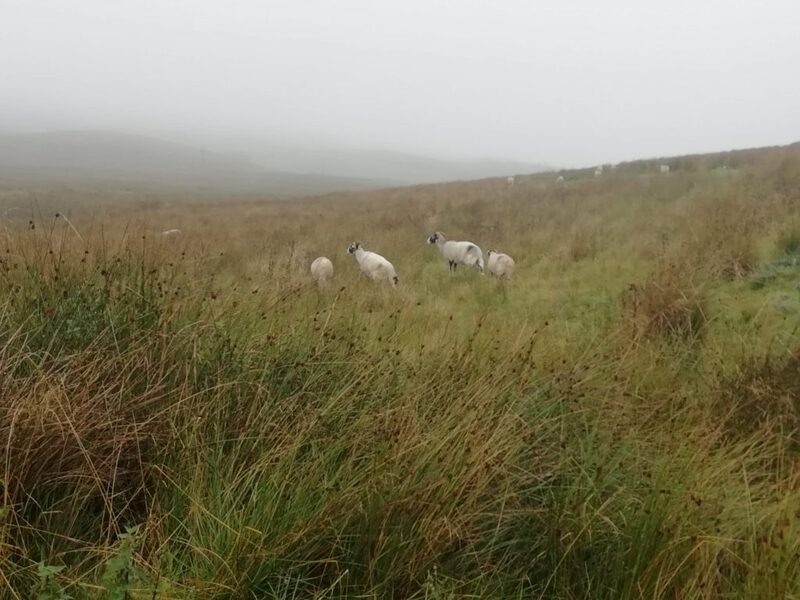 The sheep, most positioned now against high dry stone fences or in the gullies, looked at us as we passed, ready to run if we tried to join them, seeming to wonder what we were doing here in such wind. Four miles to Settle. 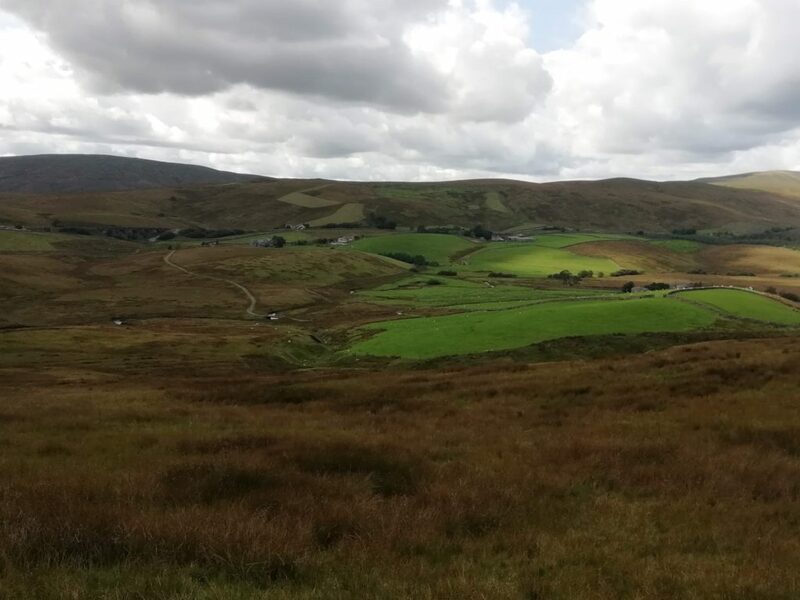 Here the moors stretched out on either side with little variation. Distant bluffs were hidden in rain and fog. Since I often like to walk faster than Walter, we had a bit of distance between us, a solitary yet linked experience of the walk. At first, still dry and exhilarated from the beauties of the first three miles, the pushing wind had little effect. As the rain began to really pelt and the wind to exert its true strength, the going got a bit harder. But leaning into the wind and crouching down a bit in the most powerful gusts, overcoming a brief moment of a kind of panic, I even welcomed the hail that came next. We each sang our own songs, the sound of the other’s voice drifting in and out softly, as we put one foot in front of another, the going much slower than before. My feet were wet from stepping into a bog near the last stream and my sweater had soaked up some water through a pocket hole I’d forgotten to zip, my hat was wet, but the wind was not cold. For all its power to push as if to lift you away over the fences and the hill’s edge, it felt like a wind that carried just a tinge of warmth from the place it was born. We trudged on in our singular ways, knowing the other was enjoying the challenge, anxious just enough for the other’s safety to stay close. Hungry and a bit tired from struggling against the wind, we rounded the corner of a hill the other side of Jubilee Cave, a place in the limestone outcroppings we’d picnicked a week or so before in nicer weather. 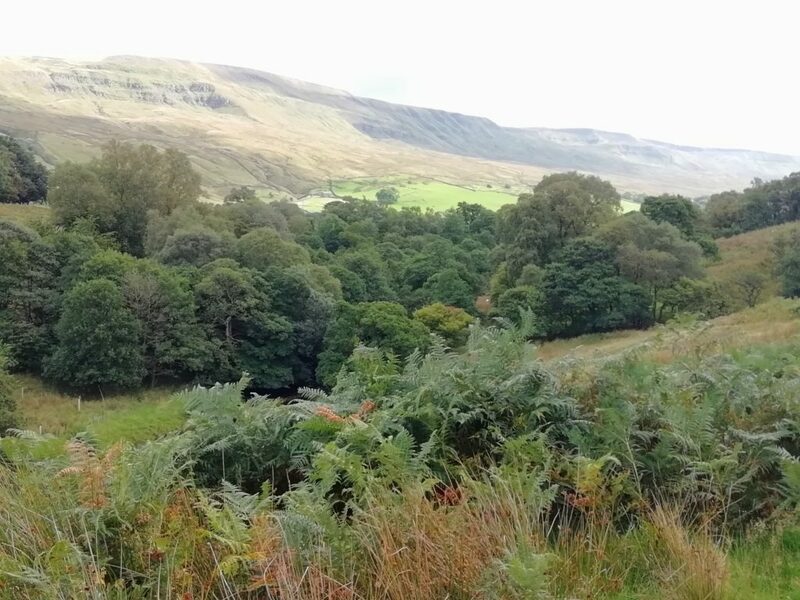 Then we had sat on the grassy, mossy hummocks with our backs to the cave, enjoying the warmth of intermittent sun and the grand sweeping view of dales to the left and outcroppings to the right. Today, we scrambled into the rocky opening as humans clearly have done for millennia, climbing over pools of water to some dry rocks at the back. Here in the last recess, there was no wind. The quiet was a relief. We were warm and sheltered. We took off wet socks and replaced them with dry ones and shared the sandwich from the hostel. Nothing like it. 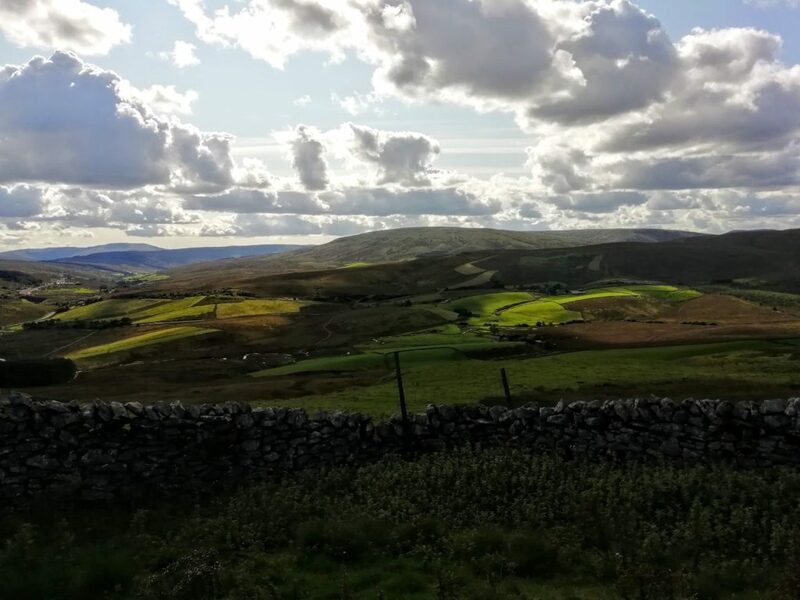 Dry and renewed, we climbed out into the still powerful wind that tried to push us back up the hill and wound our way down to the walkway of the Pennine Trail that here goes straight for a way between rows of dry stone walls. The rain had stopped for a bit and the walls gave some protection from the wind. We felt a renewed sense of happiness, a buoyancy. 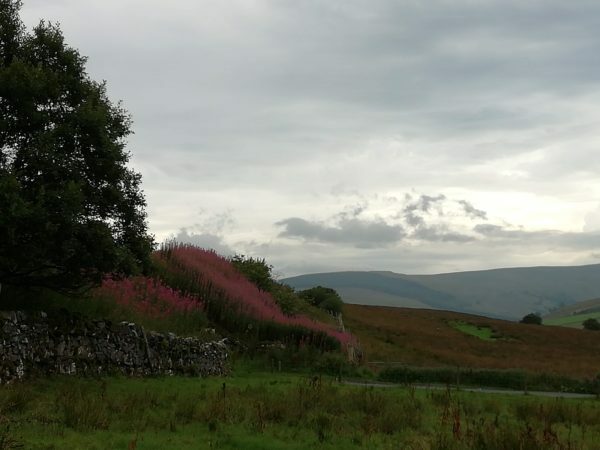 The Dales had given us a chance with a different dimension of their beauty, the power of their wildness. As we approached the gate where the other path comes down from the larger Victoria Cave, three young women with a couple of small dogs were organizing themselves as they came through a field gate, looking at a map. We asked if they needed help. They were dressed fairly lightly with no hats and seemed unconcerned about the weather. I suddenly felt overdressed and a bit fuddy-duddy. 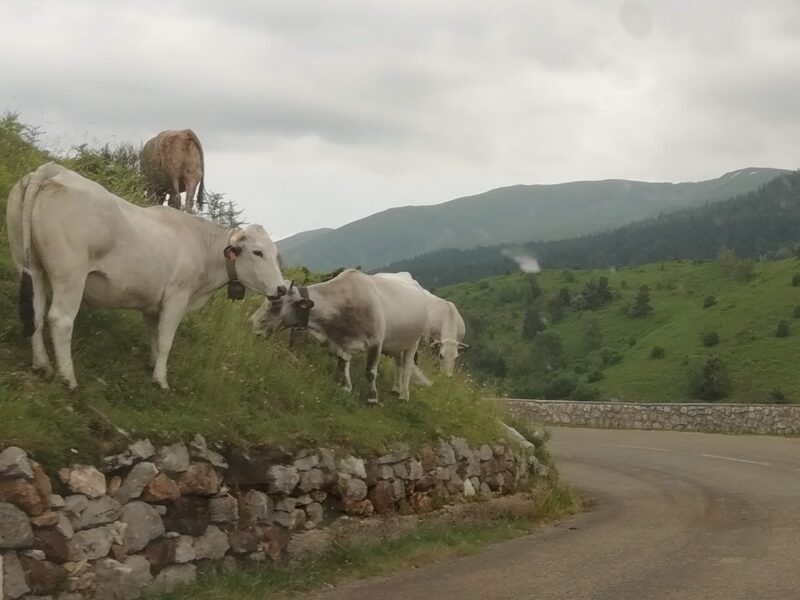 We confirmed that it was, indeed, a very unusual event for cows to attack, especially if they had no calves. “Maybe it was the wind that disturbed them,” we agreed. Evidently deciding to call it a day, they trotted off merrily ahead of us in the direction of Settle. As the rain cleared off, the wind dropped and the blue patches of sky began to appear, our jubilant mood spread itself out over the whole landscape. The path down to Settle is beautiful and now felt familiar. 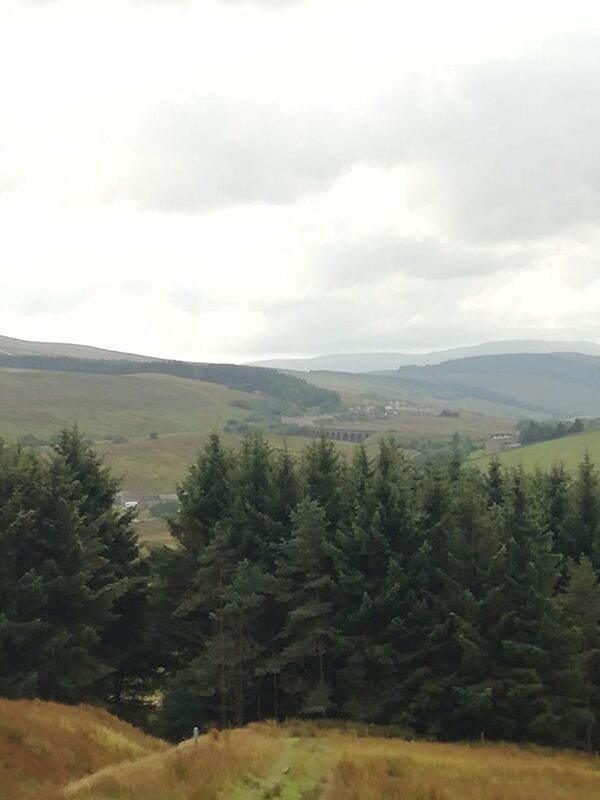 You can see the towers of the old textile mill at Langcliff as you turn down to the left along the hills. 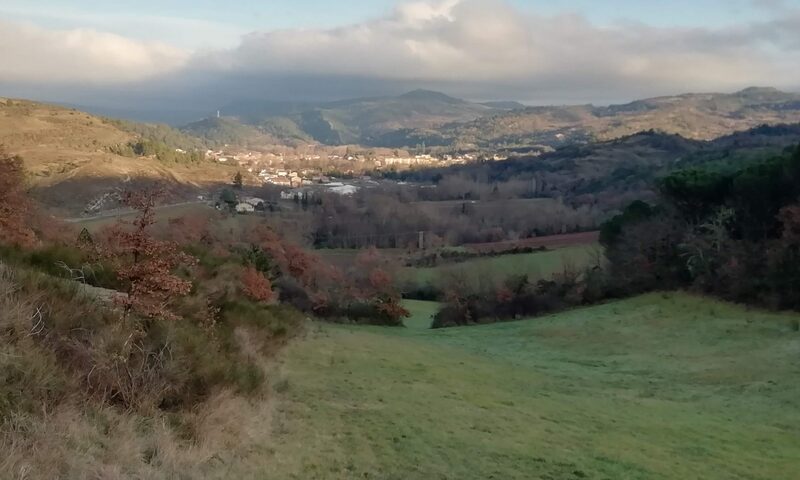 The limestone cliffs on the hills over the town loom to the left after a quarter of a mile or so and the whole town stretches to your right in its bed in the valley, limestone quarries guarding its flanks. The green of the fields around you and the misty colors of the distant fells and dales is such a satisfying background to a walk that you feel you could just go on that way forever, thinking of nothing and then thinking of something for a bit, tossing it around, following it in its several directions and then releasing it into the fresh air–being captivated by some form, some color, some particular grace of motion, some particular beauty of light while all else disappears. I am happy when I walk, even when I’m not happy. 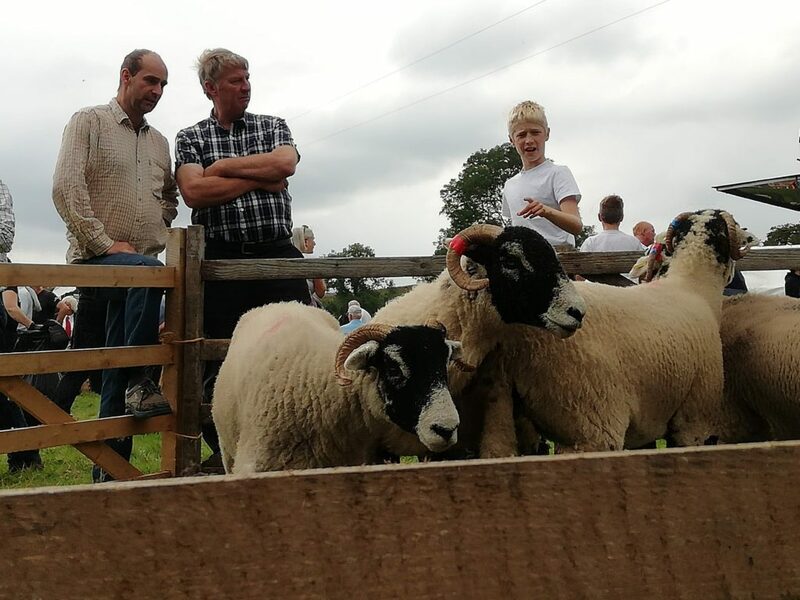 The day had arrived for the Moorcock Sheep Show. 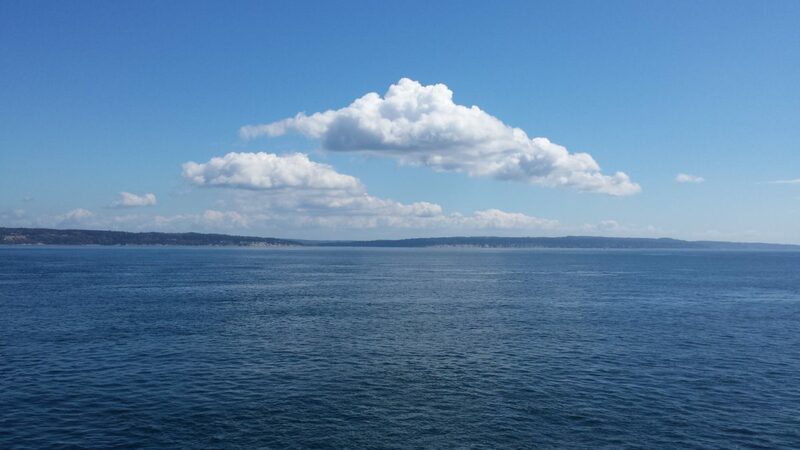 The weather was remarkably pleasant. No sign of rain. The air actually felt warm. Tee-shirt weather. Not the norm here evidently, even in summer. 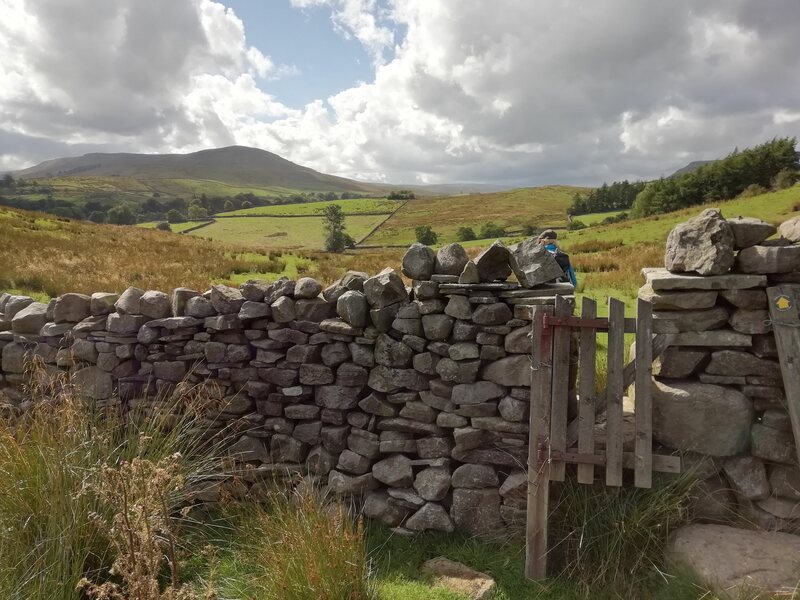 We came to live here in the Yorkshire Dales for a couple of months in the way that much happens for us—through the opening of an unexpected door. We are in a time in our lives when we can wander. 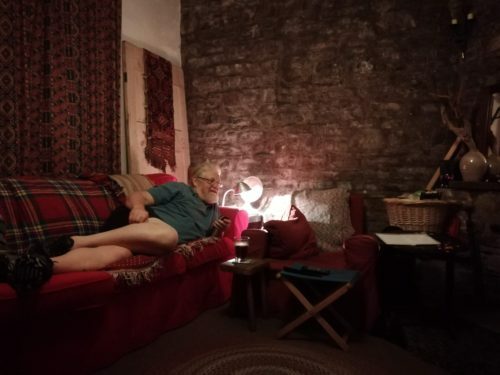 So here we are, in a little hamlet without a car, in a cozy little stone house lent to us by friends, dependent on the grace of delivered groceries and on the obscure Settle-Carlisle Train Line that runs by the cottages to get to a town or village of any size at all. As is always required, we’re tuning ourselves to the circumstances. Harmonizing. Soaking in what is present–the character of the people, the fauna and flora, the beauty of spreading hills and valleys, the geology, the air. 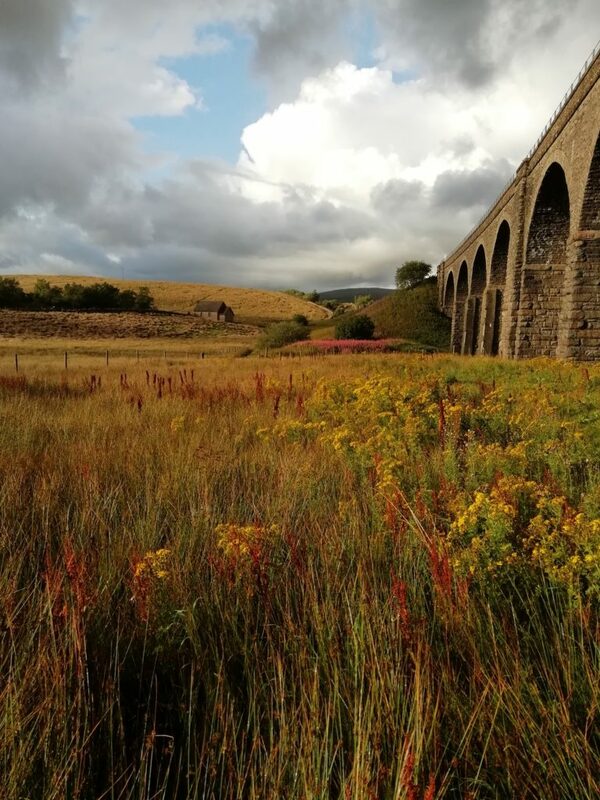 The grace of living here is that we are able to explore the Dales endlessly by foot and to chose our moments. As one walker on holiday (one of many walking and walking, day after day, all vacation long) said to me, “It’s cheating. You can wait till the rain lets up and then start your walk!” So, when we’re not writing or reading or making a foray into one of the towns up and down the line, we do. 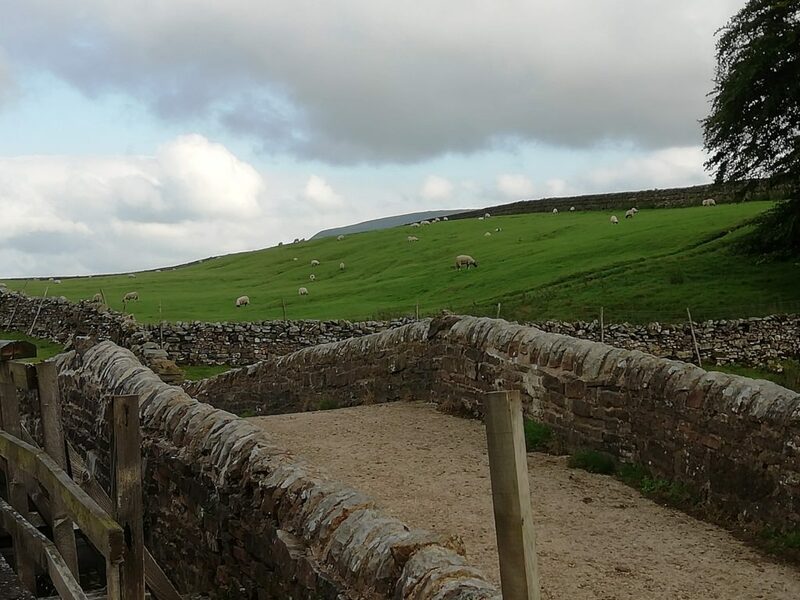 Although it is just down the A684 about two and a half miles from the Railway Cottages by car, it would take us over an hour to walk to the show on the footpaths over the fells up above the road, but the walk would be so much more pleasant. We congratulated each other on our decision as we hiked with our daypacks over the stone bridge behind the pub, past the small river Eden with its waterfalls, hearing in the distance the continuing whine of the racing weekend motorcycles as they careened down the stretches of the highway below us. After a very pleasant three-or-so mile walk, losing the path from time to time through the bigger fields and finding it again to climb the varied stiles in the dry stone walls, we arrived at Moss Beck and walked the steep tree-lined lane up to the fields where the show takes place, stopping to gather some plump rose hips along the way. When we arrived at the top, a young man, looking somehow comfortable (as Yorkshire natives tend to look in most circumstances) in a loose tweed suit coat, a button down shirt and red tie, sat at the gate with an old man who seemed to be there just to keep him company. As he took our gate fee, he welcomed us, as obvious strangers to his home, with a genuine twinkle of friendliness in his eye. I watched him as he traded quips with Walter. His slim, smooth Yorkshire face contained more expression and subtlety than you would expect from a “country boy”, more ease and confidence, a sense of self without arrogance. The unexpected delight of it hovered and hummed above the lingering exhilaration from the walk. Savoring this state, I took Walter’s hand as we crossed the grounds towards the beer tent. 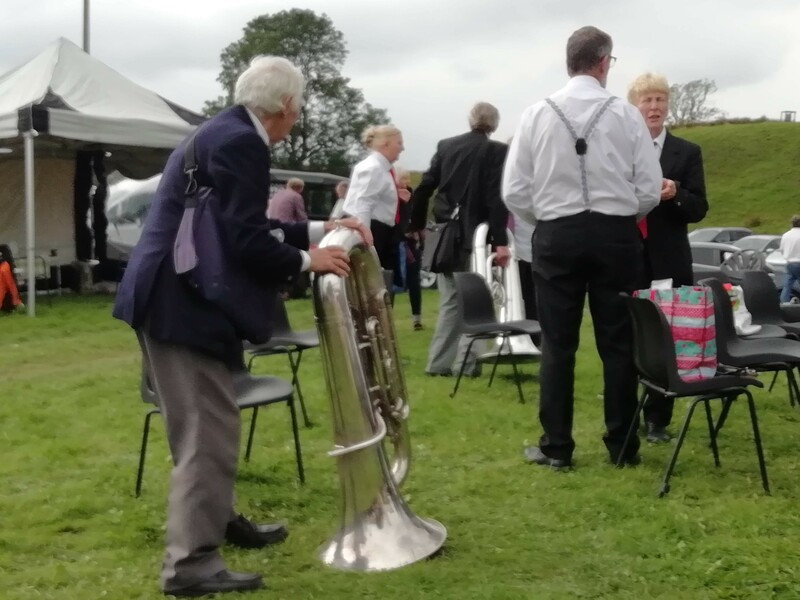 In front of the tent, a brass band was playing “When You’re Sixty-Four” as they perched on precarious folding chairs set up on the uneven grass, the men all nattily dressed in black suits, white shirts, red ties and black hats and the women in black dresses. The whole afternoon at the show was like that. Surprises. A small opening into the real life of this place. We bought Wensleydale Best Bitter, brewed in honor of the show, from the blond woman pumping beer in the tent and carried the plastic glasses with us as we went to watch the sheep and their handlers, eager to drink it all in. 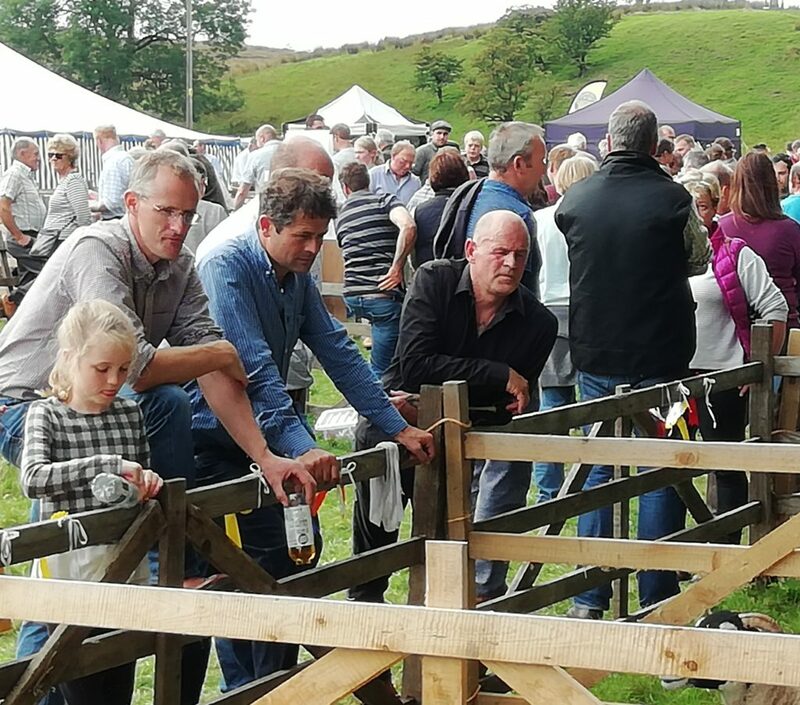 The heart of the show was the temporary pens with their movable sides enclosing constantly moving groups of sheep. 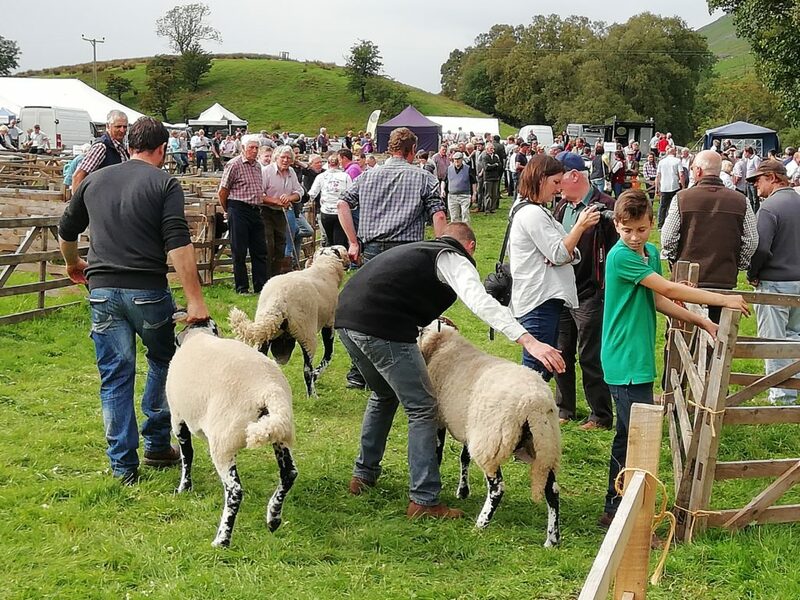 Here were young teen-aged girls and boys and their older family members all working together to manage their sheep and show them to the judges to their best advantage. We watched and read signs, trying to make sense of the action, Walter explaining what he could extrapolate from his own experience. 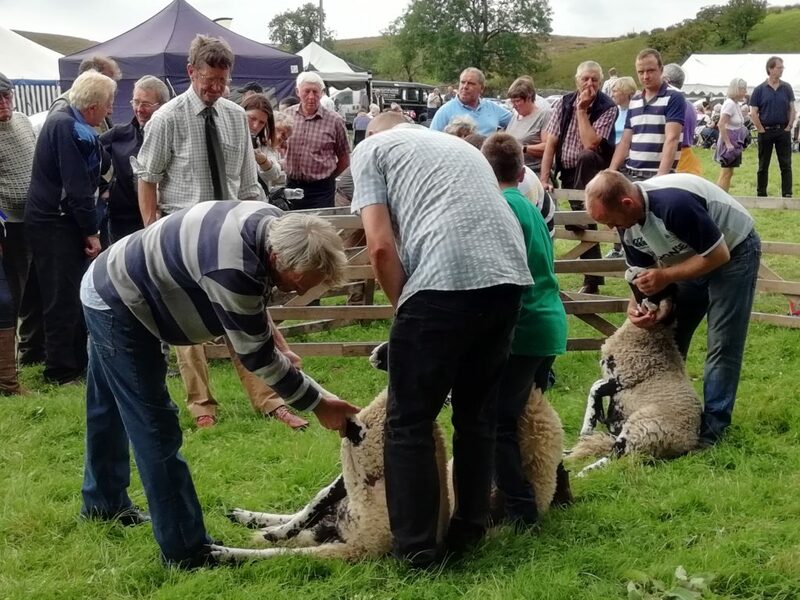 Each breed of sheep has its own “classes”: Tup Shearlings (yearlings after their first shearing), Aged Ram (two shear or above), Tup Lambs, Gimmers (ewes between their first and second shearing) Lambs, Pairs of Tup Lambs, Ewes (Small Breeder), and just plain Ewes. 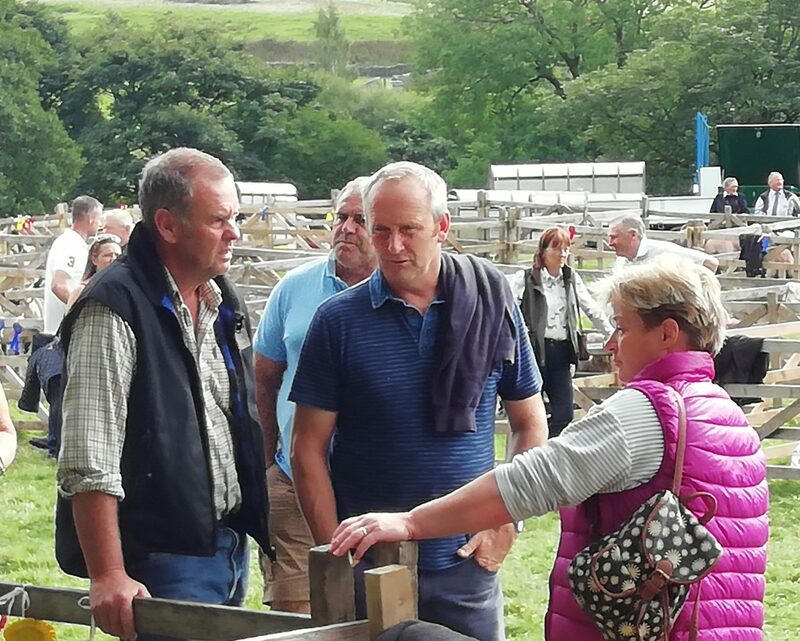 Even Walter, who had grown up with Future Farmers of America and knows quite a bit about raising and showing livestock, was amazed at the wealth of detailed knowledge represented by all these farming families, some judging and some showing, all here for one purpose. Even amidst the air of celebration, an atmosphere of activity and subdued excitement, it was a no-nonsense event. The first pens held the Texel sheep, an animal bred for its remarkable muscle development and lean meat. I learned later it was a sheep originally from Francw which had then been exported to the Netherlands, New Zealand and Australia and then back to England as a hardy animal able to roam long distances, require little care, lamb without assistance and grow to marketable weight quickly. It’s a white-faced sheep, with no wool covering the face, often with a charming big wrinkle in its nose. When we’ve seen them on our rambles through the dales they sometimes look at us with expressions like those of friendly but suspicious young dogs. On one of our long walks out through the countryside, we’d found a ewe with her head stuck in a fence made of big wire mesh. She had evidently been there for some time, bleating, but it wasn’t until we slowly walked up to see if we could help that she reflexively pulled backwards, easily freeing her head from the noose. Wonderful animals, but likely not as intelligent as dogs. 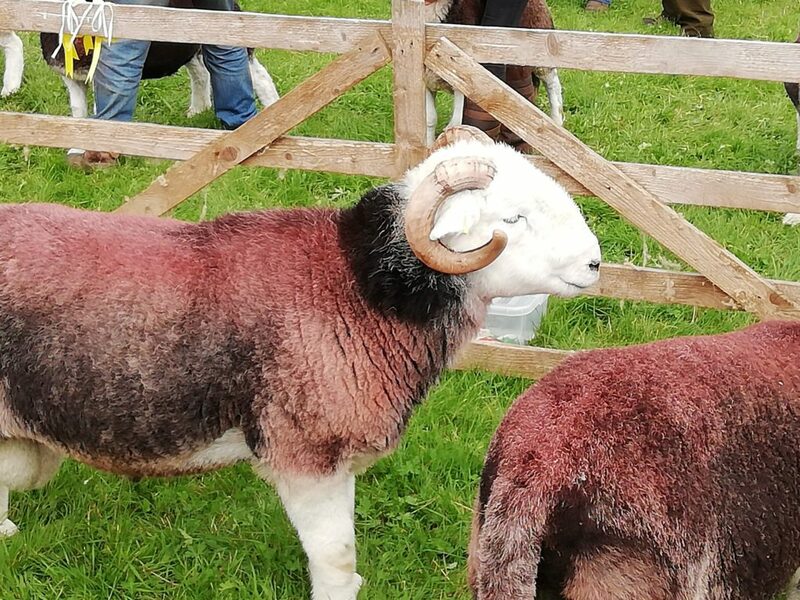 These were beautiful beasts in the pens, wool fluffed and died a light rosy brown to accentuate their colors, magnificently proportioned. The young men managing them in their pens were clearly happy to show them off to admirers–and to be admired themselves. Then there were the now familiar Swaledale sheep with curling horns that remind me of the wild Mountain Goats back in the Rockies. They’re the sheep we see on all our walks from the cottage, with their black faces and white noses. Up here in some of the highest parts of the Yorkshire Dales, they are easily able to over-winter on the fells. Like the wild Mountain Goats, both the ewes and the tups have curling horns, although those of the tups of both the wild and the domestic are much larger. On our way over to the show, we’d even seen a ram looking somehow mythic with two sets of horns. They scramble over everything, and their black and white faces lifted in mild curiosity have become the characteristic greeting as we walk along the footpaths through the fields. Since they are our neighbors in the fields spreading out around the Railway Cottages, I’ve tried to learn more about them. Named for the Swaledale Valley near here, they are used primarily for their meat which is of good quality both as lamb and mutton. I think I’ve even bought some in the butcher shop in Settle. Their coarse wool, known for its durability rather than beauty, doesn’t command a very high price but is used for carpets, rugs and insulation. The ewes, very good mothers who can raise lambs well even under harsh conditions, are also used to breed the Mule Sheep, here often crossed with Texel tups. We saw some of these Mule Sheep in the next pens, blue and black faced with wool of good quality, good hardiness, good meat, and ewes that often birth twins—a huge advantage to the farmer. Finally, we moved on to the pens with the Herdwicks with their white woolly faces and greyer bodies, looking like the iconic sheep that they have become. Something about the width of their faces and the set of their eyes makes them look particularly appealing. We hadn’t seen any of these on our walks. 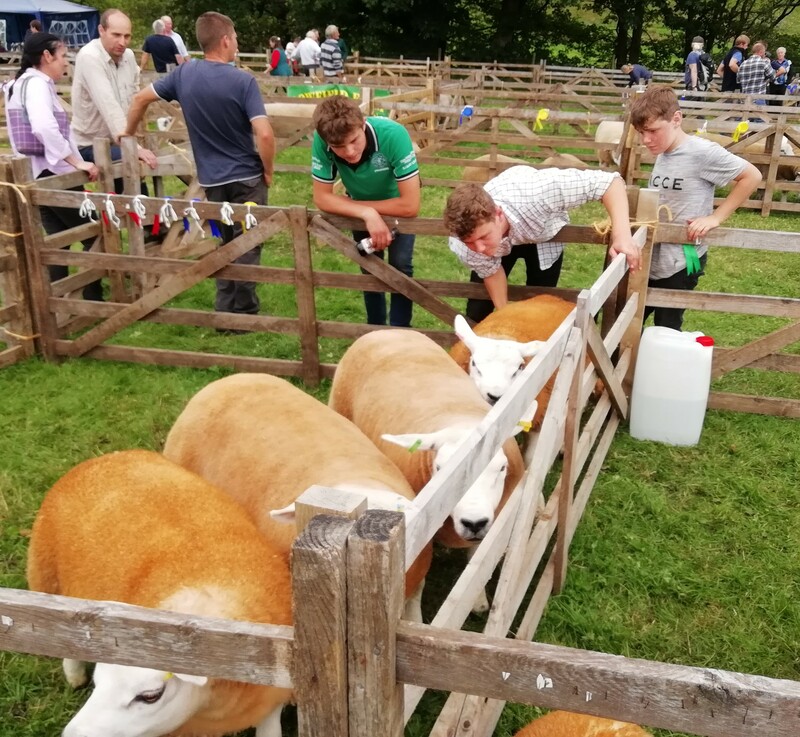 It turns out their genetic characteristics are specialized for the conditions of the Lake District, a region quite nearby here but geologically quite different. 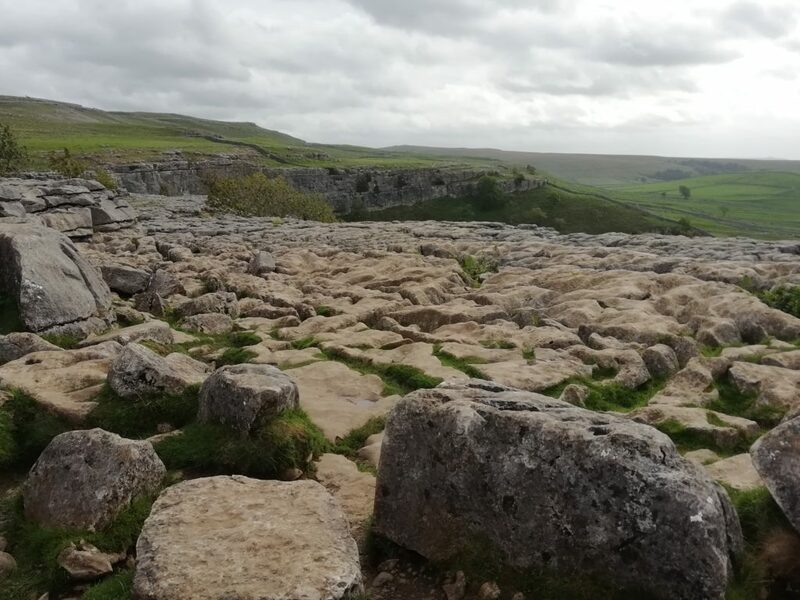 Due to its origin in violent volcanic activity, the primary rock there is granite while here in the Dales, once under the ocean, there’s abundant limestone. There the granite, which takes much longer to break down into soil, created a terrain where lush grass is much harder to cultivate. The Herdwicks have been the sheep of that region since at least as far back as the twelfth century, able to graze (as we soon learned) even on lichen. As we admired the Herdwicks, we remembered together how we’d recently discovered they were Beatrix Potter’s favorite sheep. 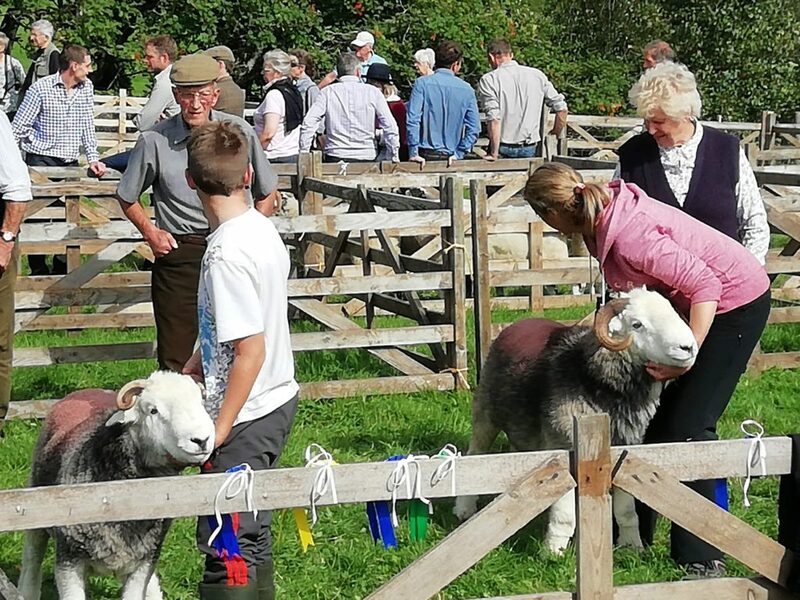 She, in fact, had become the first female elected president of the Herdwick Sheep Foundation, a mark of the high esteem in which she was held by local farmers of her beloved Lake District. What we didn’t know at the time was that she was an expert mycologist, self-taught, highly insightful and curious, who had become fascinated by fungi and lichens at an early age. Because of this passion, she learned to produce highly detailed, accurate, full-color drawings of the specimens she found on her walks around the countryside where she grew up. Her idea to create the richly illustrated children’s books that made her famous came only after the rejection of her work on the dual hypothesis of the nature of lichens (called “On the Germination of the Spores of Agaricineae”) by the all-male Linnaeus Society. It was then that she recognized that she would not be able to make her way as a scientist in a persistently misogynistic environment. Undefeated, she decided to use her skill in drawing from nature to earn her living in some other way. 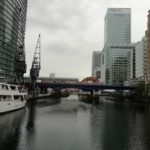 She followed the advice of an old family friend who was involved in publishing and tried her hand with children’s books. Remarkably, it was these books, with their exquisite depictions of the animals and plants of the English countryside that, through their enormous popularity, insight engendered the beginning of a conservation movement in Great Britain. Her children’s books and drawings stirred a sense of the importance of Britain’s natural heritage Britain in the same way that the writings of the Scottish-American naturalist, John Muir, did in America. Both are considered parents of the conservation movement of the twentieth century. In her late thirties, with an inheritance from her aunt and the money she’d made from her astonishingly popular books, she bought Hill Top Farm in the Lake District a place she’d gone frequently for the holidays of her childhood. There she dedicated herself to living simply and caring for the land, the flora and fauna, and the sheep that depended on it. 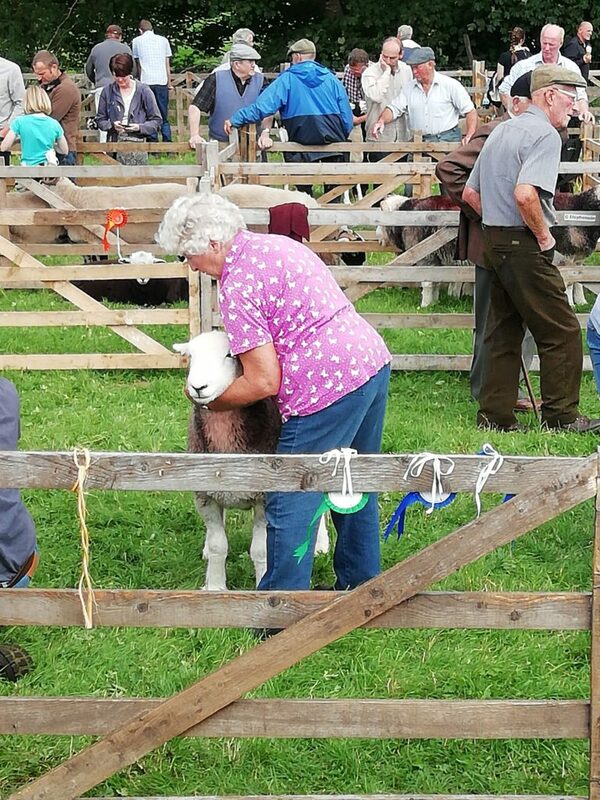 While managing her large and expanding farm, supporting efforts to save the rare Herdwick breed, and continuing to write her children’s books, it was at Hill Top Farm that she was also able to return to research in mycology, her original passion. Walter, who grew up without the delights of children’s books (and who developed a healthy scepticism of all things charming) found a surprisingly kindred spirit in Beatrix– someone rejected by the system who, undeterred, continued to pursue observation, research, advocacy and writing in the quiet spaces outside academia. Another surprise. As we stood there discussing Beatrix and her love for Herdwick sheep, I noticed a man about our age standing near us. He was slim and not very tall and had two dogs on leashes, one a black and white border collie, the other a smaller beagle-like dog. By the look of his face and the ease of his bearing, he was clearly a part of the local Yorkshire crowd. He was in his element, yet his skin was incongruously tanned and, unlike the other men, he wore a small earring and had a decorative cotton scarf tied around his neck. The look was familiar. As I overheard him talking to a couple with their own large dog, I noted that his north country accent was tinged with a familiar lilt, an overlay of the sounds of French. I was intrigued. 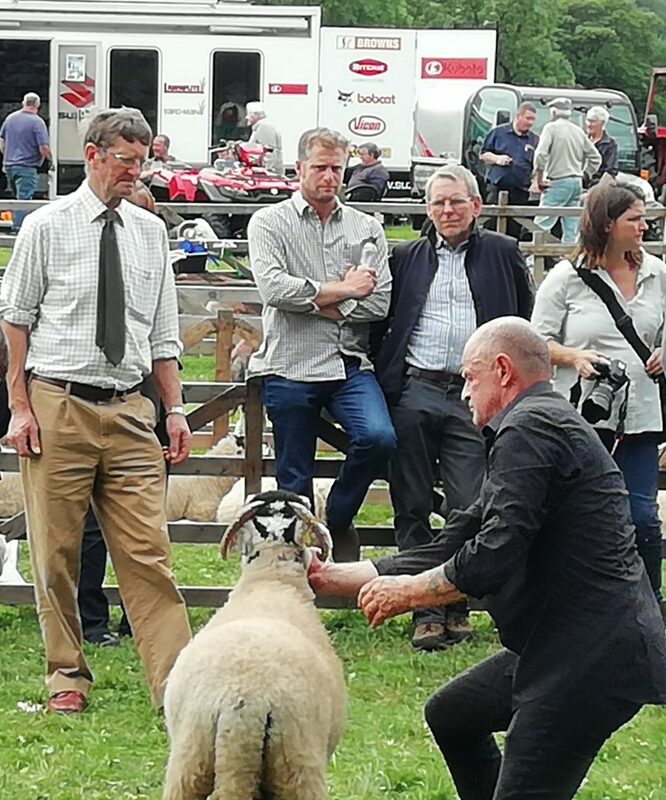 As he stood next to us, talking about the sheep to another local, I finally got up the courage to join in and ask a question. “We haven’t seen these Herdwicks on our walks around here. Are there many in the Dales?” I asked. We settled into conversation. Here was a local who could answer so many of our questions about the husbandry of the sheep of the Dales. 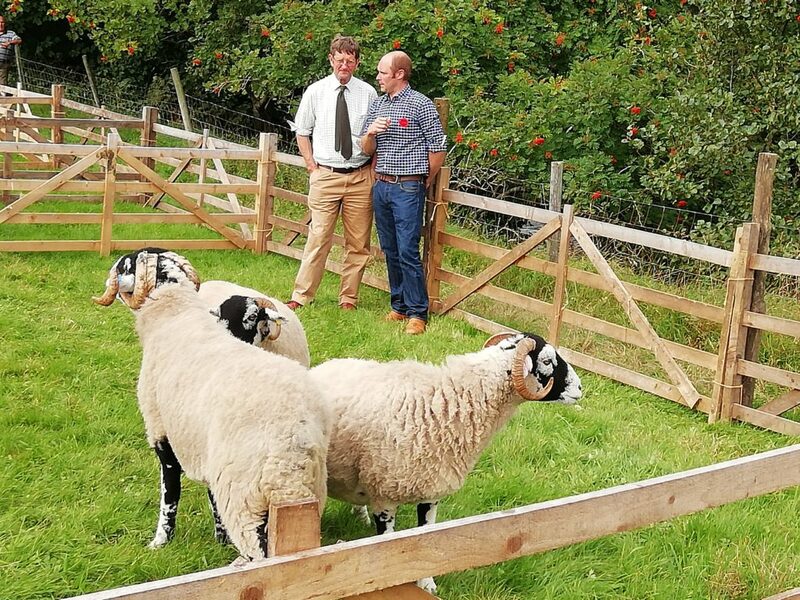 We learned about the financial value of the Tups and the Gimmers and what the judges were looking for in the different breeds of sheep. “It’s a great place to live. You have to learn French, eh? They’ll respect you more.” We agreed. As he relaxed, his French accent became more pronounced once again and he began to deliberately slip in a word in French here and there to tease us. As he talked, he managed his two dogs, sometimes speaking sternly to one or the other until they settled again and he could continue. His story was a good one: a story of a difficult lot that turned lucky. He was the younger of two brothers. When his father died, as has been the case through the millennia, his older brother inherited the sheep farm. 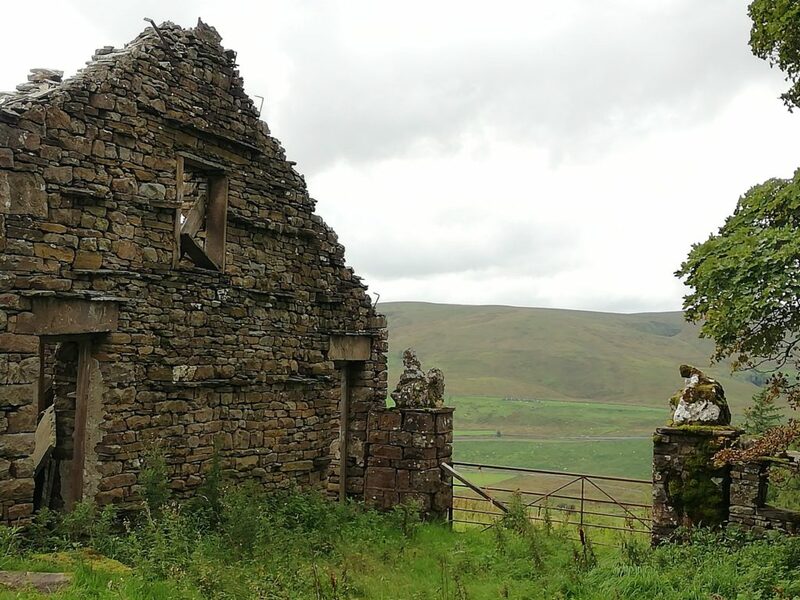 Instead of forcing his brother to give him his share of the inheritance, he decided at the age of twenty-one to leave his own share of the inheritance money to his brother so the farm would have the investment it needed to stay alive. 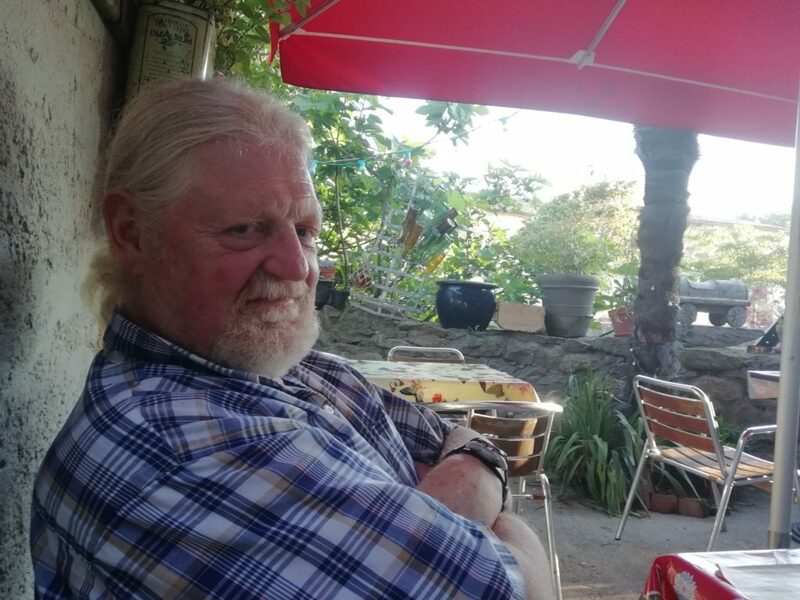 He, in fact, said he had the good fortune to be at the right place at the right time and landed a job doing landscaping consultation for Prince Charles who had just purchased the estate at Highgrove. The rhythm of his story-telling was now in full swing. As we were leaving, a family came by with two large dogs, one quite young, the woman trying awkwardly to sort them out and keep them away from the man’s two smaller dogs. He engaged with them and soon was asking about the dogs. The young one continued to pull at the lead and wind himself around legs. Our new friend told them that their dogs would soon learn–if they were smart enough. “Here’s the way you tell if they’re smart,” he said. To demonstrate, he showed us the hairs under the chins of his own dogs. First the border collie. On examination, the family’s young dog had three. Lucky. They confirmed that he was, indeed, very smart. The other had two. “In France, we take every opportunity. We’re greedy! Good luck with your life in France!” he said with a laugh, pulling in his dogs as he turned to walk on towards more friends and more talk. Who knows about such a guy? Another surprise. In true French (and perhaps Yorkshire) fashion, we never exchanged names but came away friends. 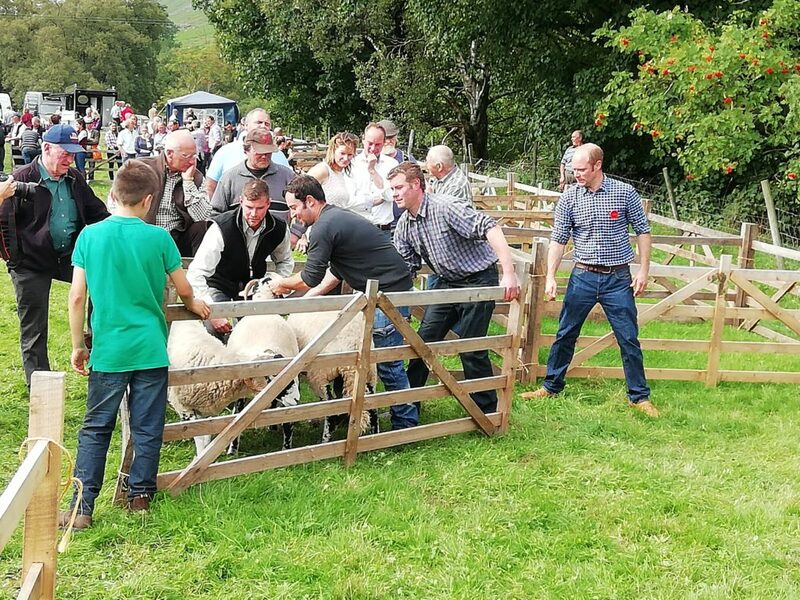 We lingered for a long while, watching the farmers and their families expertly show their sheep, guessing at which would get the red ribbon as first prize, wrong more times than not, learning a lot about the people and their sheep in the process. We ate our lunch on the grass with another beer, bought some cake, a pair of hand-loomed local wool socks and some homemade preserves to take home and walked the four miles back, stopping, of course, at the pub that’s a mile from the cottage for one last pint, some wonderfully hot and crispy chips (French fries) and a bit of chocolate cake. As we sat together near the window, enjoying the light of the late afternoon and the background of soft Yorkshire conversation in the now familiar room, we agreed that what we had just witnessed was the evidence of a complex knowledge that runs very deep in this culture. 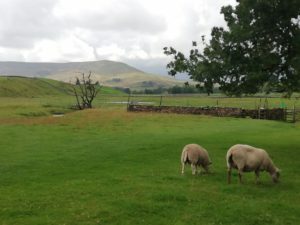 It is a knowledge of the nature, breeding and care of sheep, of the land and of the weather, passed on through a few thousand years, for as long as the Dales have been denuded of trees by the people who have lived here. 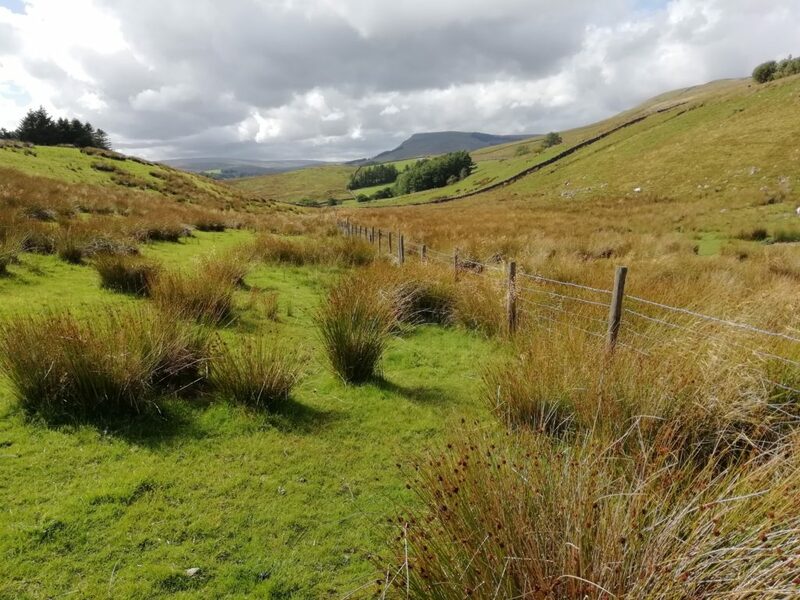 In this place of rolling hills with its intricate network of valleys and the rise and fall of the fells, its winds and its rain, the histories of the sheep, the vegetation and the humans are so closely intertwined as to be impossible to untangle. Each has contributed its breath to this seemingly simple yet complex atmosphere. And now we, too, are breathing it in, greedy as the French for all it contains. Up to the top of the fells again today, this time with a pack and a little lunch. I’ve walked about eight miles a day the last few days, with slight variations in my route. Today it was down the A684 road past the renovated stone house, past the little Methodist Church build in 1878 for the railway workers, past the Moorcock Pub, through the gate to the Pennine Bridle Way, through the sheep fields, over the stone bridge across the infant river Eden and up the hills past the cleft in the hill with a stream and a waterfall and up to the big old ruined lime kiln at the base of a limestone outcropping. 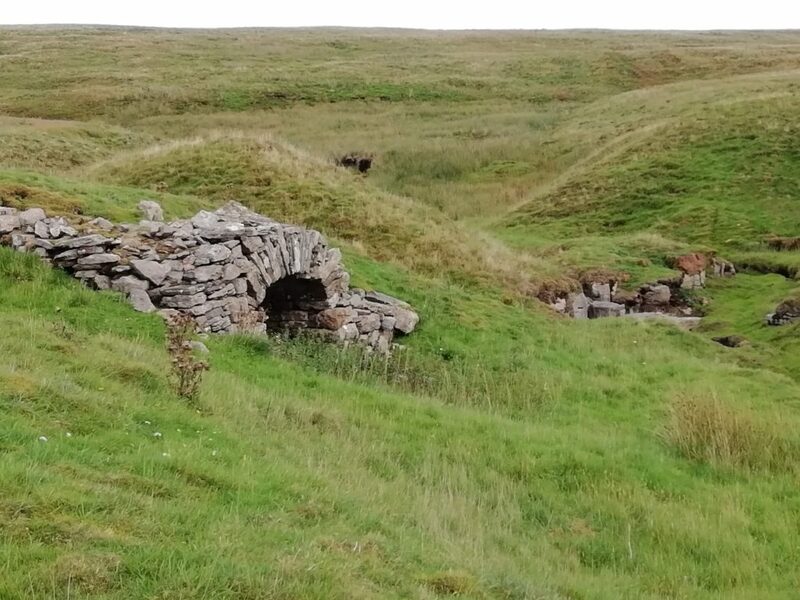 Just above the kiln, I go through yet another cattle gate in the dry stone walls, turn right, as I have now for three days running, and start out along Lady Jane’s Highway toward Hell Gill. I keep trying to get all the way to Hell Gill and beyond but I only come close before it’s time to turn back for one reason or another. A few miles beyond Hell Gill is the enticing Pendragon Castle, which dubious legend says was where King Uther, King Arthur’s father, died. As with so many cultural ideas, there are many reasons why it cannot be so, but the idea is so appealing in its beauty that it persists. The other day I met a local man who was coming through the gate at the top of the hill just as I approached. His black and white border collie came toward me tentatively and circled back as the man closed the gate behind him. We exchanged pleasantries and, as often happens, my accent lead him to ask where I come from. As it turned out his wife is also American. We talked about the Dales and the similarity here to the weather I’ve known in the Pacific Northwest. I asked some stupid questions about the Lady Anne Highway. He answered with great forbearance. He told me that the first two ruins along the way had both been inns when the road was the only one in the area. The first, High Dyke, more tumbled down than the second, had been built in the early 17th century and the second, High Hall, about 100 years later. We went our ways, he with his dog for their second walk of the day up on Lady Anne’s Highway, me down towards the Moorcock Pub as an ending to my afternoon of walking. Over the days that I’ve walked there, it has been this second ruin, High Hall, that’s come to capture my imagination. Perched there along the ridge above the fells, it had been built right on the high road where the drovers used to drive their sheep to market and everyone had used from time immemorial to travel from one town to another. 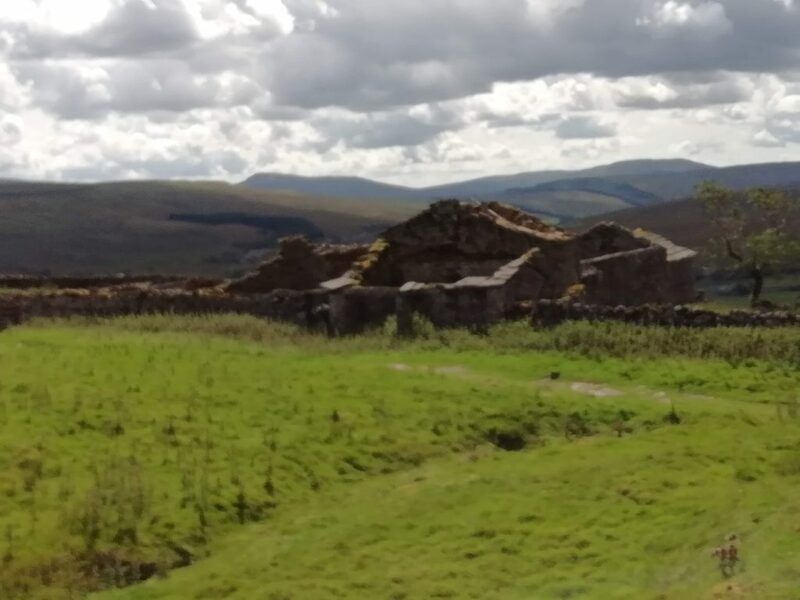 Lady Anne Clifford (for whom it came to be named) used the road in Shakespeare’s time to travel from her castle in Skipton to her castle, Brougham, in Penrith. High Dyke, the older farm and inn, must have been there along the way. Perhaps she and her retinue stopped for refreshment there or even spent a night. High Hall was built after Lady Anne’s day, sometime in the early 18th century when the road at the top of the ridge was still the only way to travel from one town to the next. Some of its walls have fallen in, huge stones lying in heaps among the rubble of the roof stones. Other walls remain almost intact. 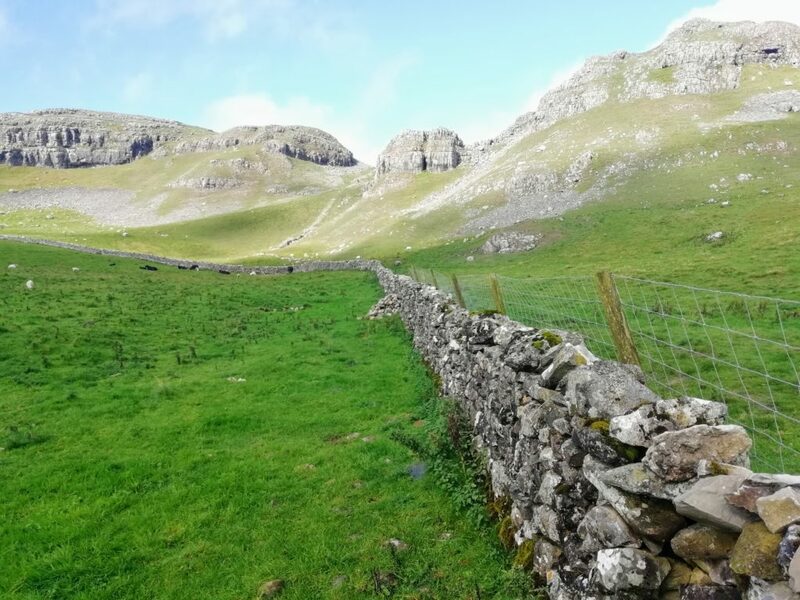 On the south-west side of the ruin, where the buildings end and the hill falls away, two imposing dry stone pillars frame a spectacular view of the valley, the fells and the limestone cliffs stretching out below in their quiet, misty magnificence. A huge chunk of raw limestone rock perches on each of these high stone posts, their odd, strangely evocative forms the only remaining elements of the ruin that seem ornamental rather than structural. Their presence, so whimsical, is a link across the centuries. Leaning over the wall on the opposite side of what now is a courtyard bounded by dry stone walls, I can look directly through the opening between the pillars. I stand for long moments lost in the sense of grandeur that huge frame creates. 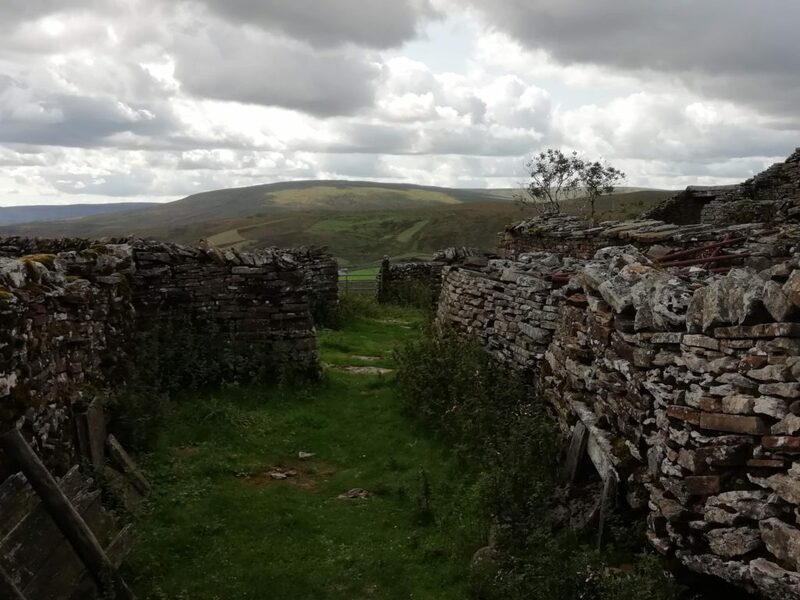 I can feel the life that circulated through these rooms, quiet talk and louder laughter, dogs barking, sheep bleating and people pausing to gaze in thought at this same view, lost in the expanse. These visions enter my dreams. As I lie in bed waiting for sleep to capture me, I think of what it was like to sleep inside the walls of that house, rough woollen blankets pulled around your chin, the quiet dirt and limestone road just outside the door and the moors stretching down the hillside into the vast valleys, the strength of the stone surrounding you. Dreaming is deeper here. 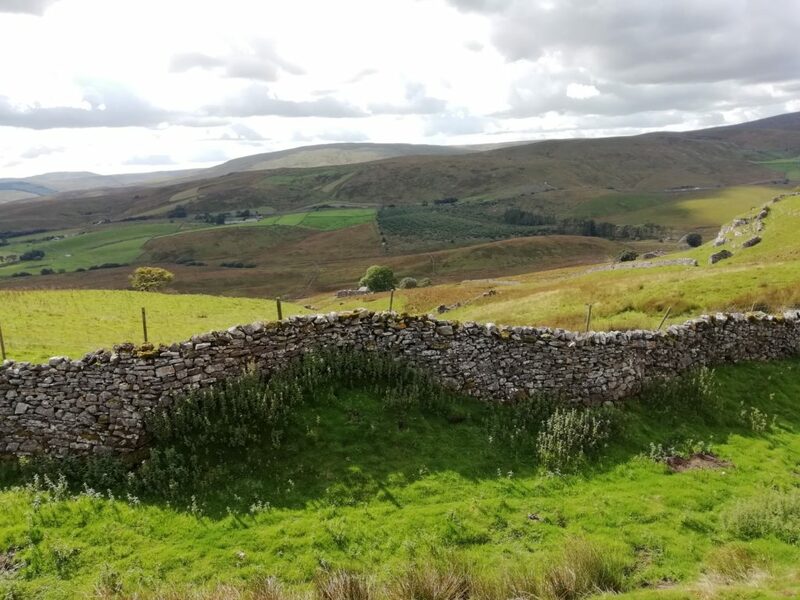 The dreams go on in ways that can be followed forever through the vast rooms of the unconscious, just as you follow the pathways and climb over the stiles in the vast valleys and fell-sides of the dales, one view giving way to another as dream melts into dream. 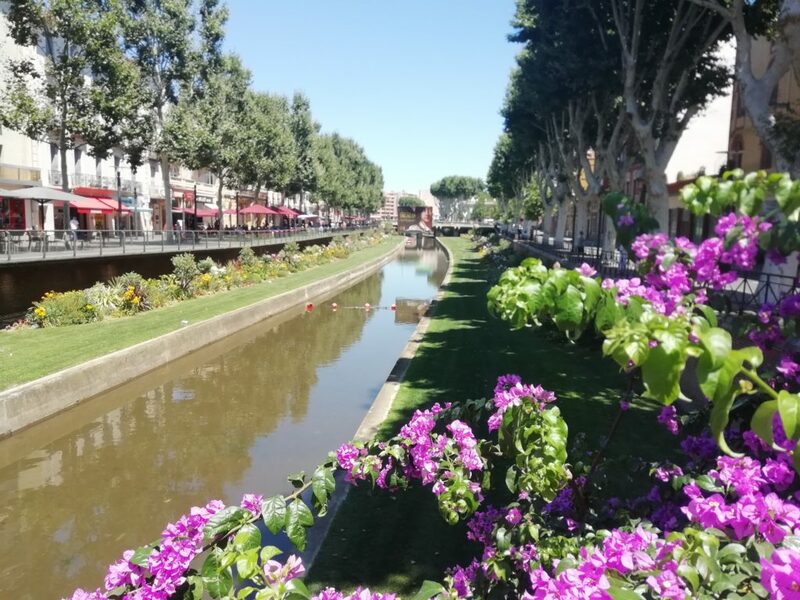 Today we got in the car and drove over the Pyrenees Orientals to Perpignan, just because we wanted to see where it was that all the people from our village in Aude want to retire. We thought we might also go to the beaches not far from this city of France which considers itself Catalan, but that was not to be. It was a beautiful drive, as all drives are in this part of France. 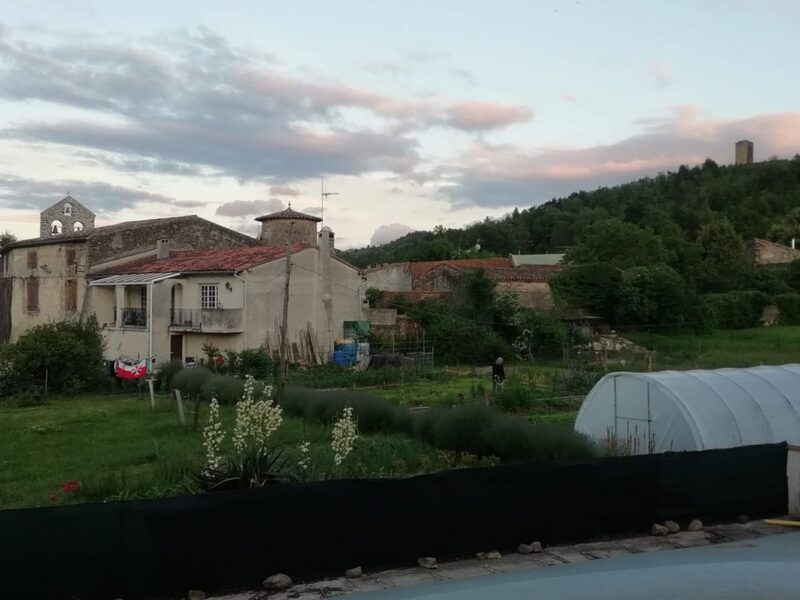 Over the last two months living in the department of Aude and travelling through the Ariege, our perspective has changed. 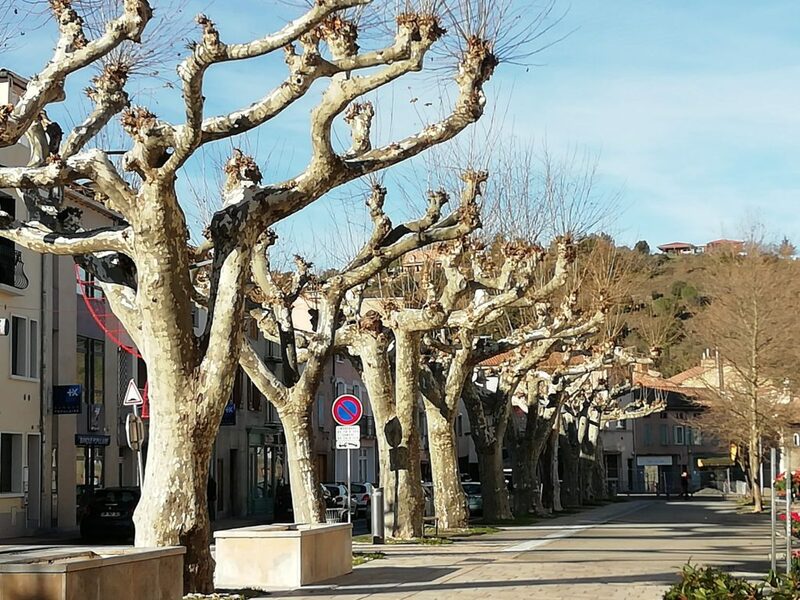 Our big town has become the town of Quillan, with its population of less than four thousand. On this scale, Perpignan is a real city. There are several pharmacies, a suburbs, several Supermarches, many chic stores, and many, many, many restaurants. There’s a very pretty canal there of no apparent name. 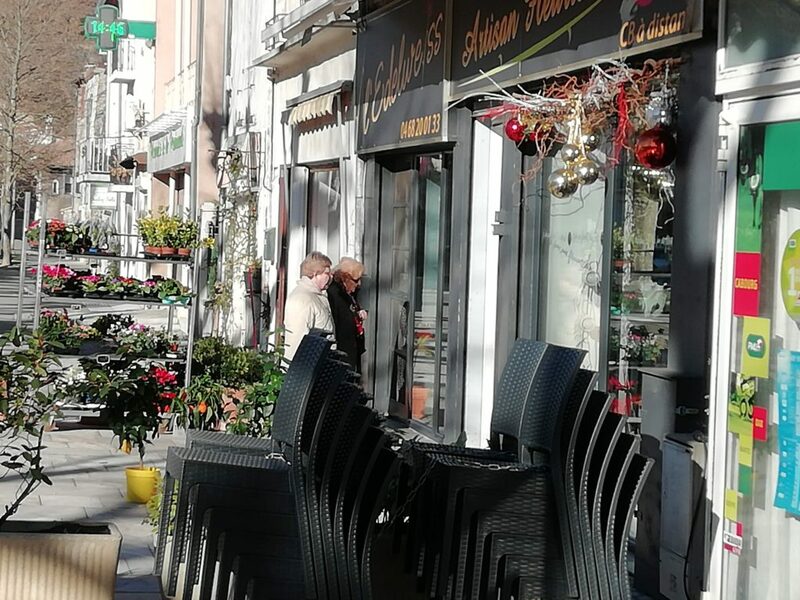 As we sat at a small cafe at a vantage point we watched while many women, young and old, of many nationalities, took selfies or posed for photos. There are several “Parkings” labelled as usual with big blue Ps, and a museum that boasts an exhibition of Hyacinthe Rigaud, a painter evidently born in Perpignan in 1659 who died in Paris in 1743. Poor guy missed the revolution and evidently painted many great portraits of nobles with fantastic wigs (or was it their hair, coiffed to perfection?). The brochure I picked up about the exhibition is written in Catalan. Even so, I pick out these facts and the estimation that he was one of the portraitists most esteemed in his time. I’d love to see the exhibition. Some other time. We decide to pick up some things at the big pharmacy and head out of town, to return when we are settled and the weather a bit cooler. 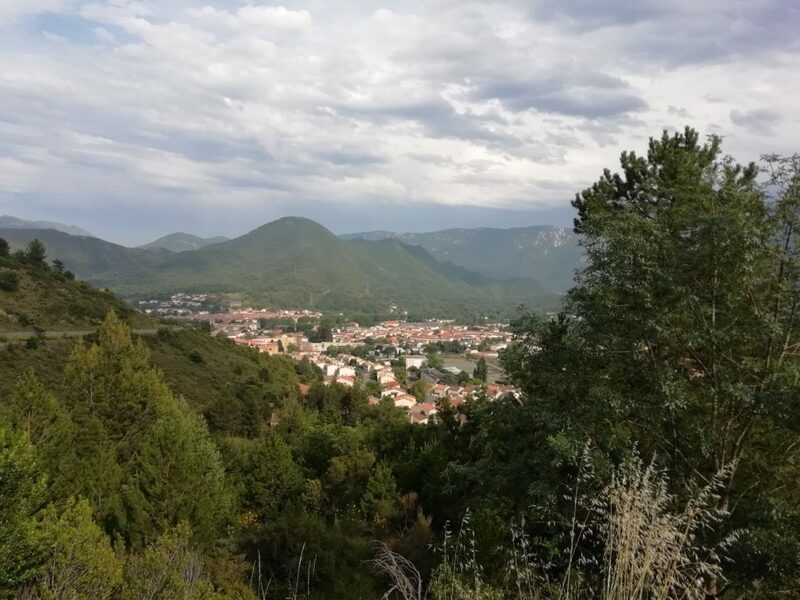 We went back the way we’d come, through the towns that used to be labelled as part of Roussillon and are now part of Pyrenees Orientals. There are beautiful views of mountains and granite cliffs. It’s a terrain full of apricot, peach and nectarine orchards and extensive vineyards that specialize in white wines, both flinty and sweet. After stopping to buy a kilo of fresh apricots at a truck stand (where an older couple was buying 84 euros worth of fruit for themselves and their neighbors and complained about the system of weighing and labeling your own produce at the local Carrefour), we were attracted, as we drove through the village, to a shop in Maury, where there is truly flinty soil. The shop was called Les Vignes D’Elodie. We tasted a sweet wine like Muscat and a drier wine with mineral tastes and bought both. The woman in the shop, tanned, with a face delicately lined, looked both old and young and was the mother of the Elodie who makes the wine. We complimented her both on the wine and on the beauty of her daughter’s name and got back on the road. There’s a wonder I recognize from time to time during the day—a wonder that I am actually here. When I say “here” I mean both in this place that is constantly new, constantly unfolding beauties, a place I dreamed of spending long days but never really thought could be, and then “here” in this body, looking out through these eyes, speaking words in a language unfamiliar yet not, hearing these people around me, tasting the air and the water and the wine, moving around, somehow a network of nerves and veins and cells propelled by something called a consciousness. It is here now, it was someplace else before. It contains all the information, all the sensory impressions, all the traces of emotions that have accumulated in its passage through all those other sets of molecules, many of which also seem to contain a similar ability to accumulate these experiences and to remember and retain, or lose and forget. Believe it or not, the Fourth of July passes totally unremarked in France. We only remembered what day it was for the US when I got a FaceBook message from my daughter in Seattle during her early morning and our early evening. 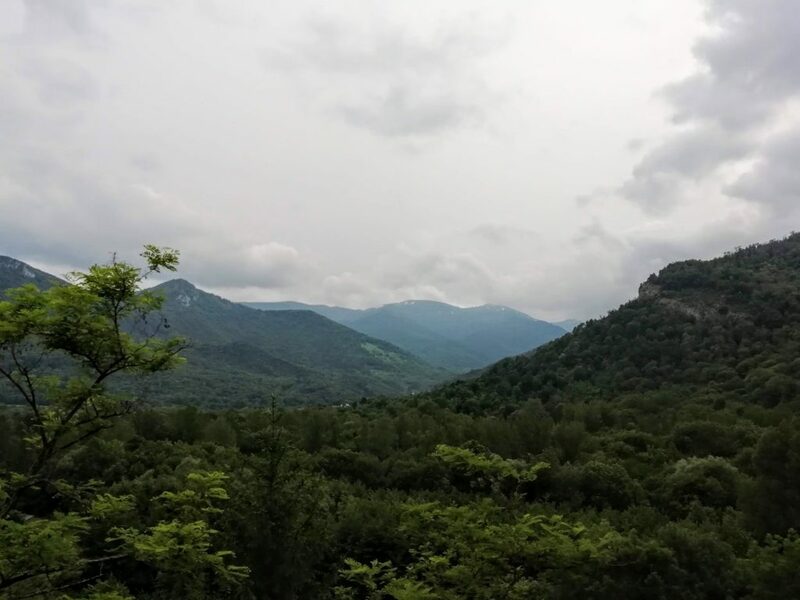 We had spent the day driving through the Ariege region with our young French/British realtor to the area around the village of Massat, at an altitude of a little over 2000 feet. 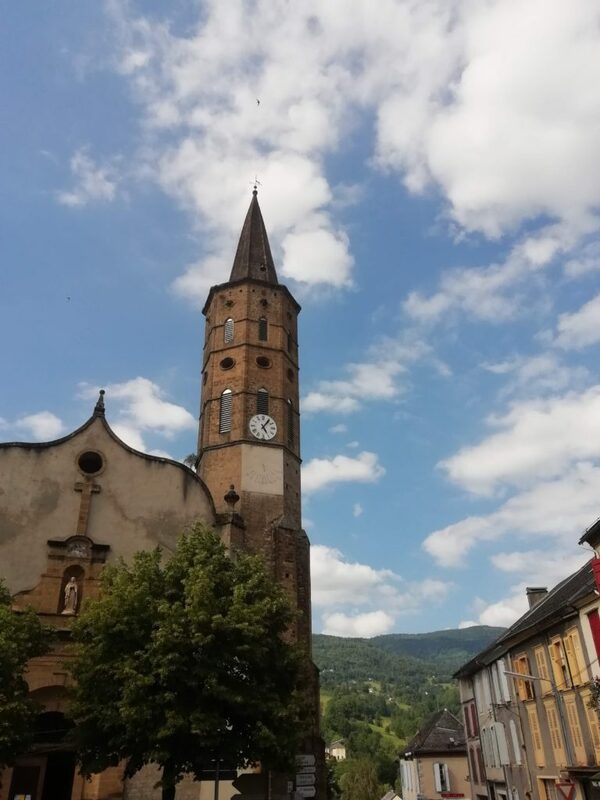 We drove back through the town of St. Girons, taking the winding road back to Lavelanet. Each time we’ve driven this gorgeous road through the mountains, it manages to catch my breath with wafts of vertigo as we drive along the knife edges of hills descending at ridiculous angles to streams below, stone huts perched on their small bits of level land before the fall. 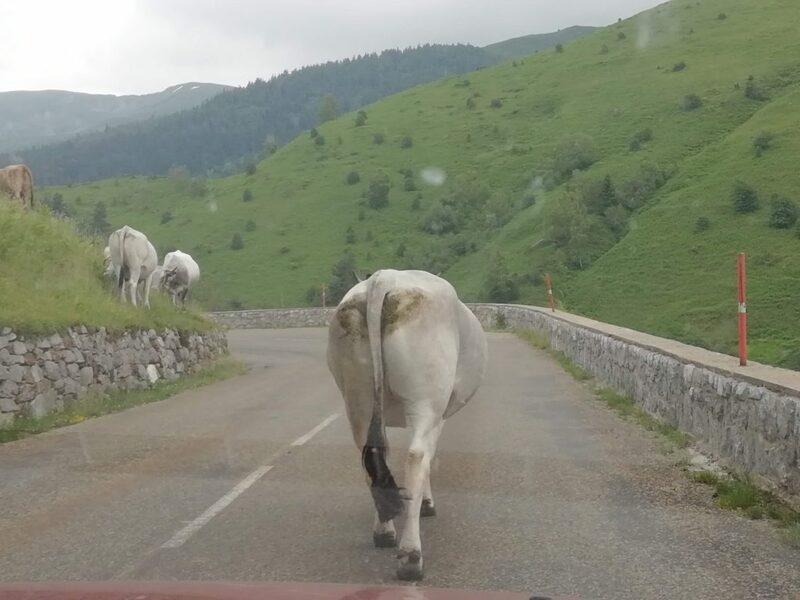 With the windows rolled down in the cooler air, the peaks of the Pyrenees white and craggy in the near distance, we heard the sound of countless cowbells from the beige Blonde d’Aquitaine cows grazing in the nooks and crannies of the green hills, occasionally wandering down to the road where they walk sedately, big bell clanging, long tails waving behind them. 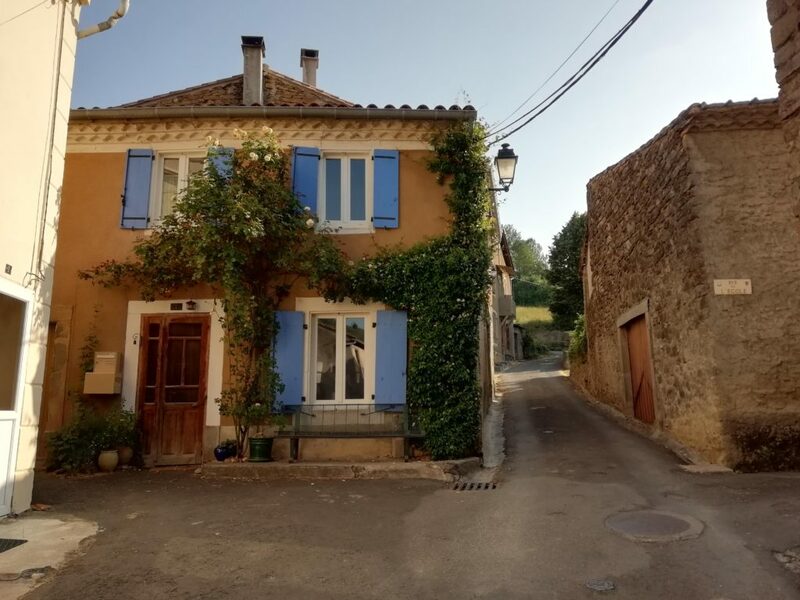 Back in Lavelanet, the realtor dropped us at our car and as we drove back towards Fa, the village we call home at the moment, I thought of what it will be like to settle here in the south of France. Here where the rhythms of life flow more easily, where people have both more warmth and yet different ways of prejudging. Projects hover around me, needing the time to spread out. They pull at my sleeves and I quiet them, saying, “Look at where we are! Just look around you. Enough!” There are friendships to be settled into, friendships that will need cultivation and thought, decisions to be made about which area feels most like a home to us, which has the climate that is both clement enough in winter yet temperate enough in the height of summer, which place has the best land, the best soil, the nicest situation and a house good enough to move into and make our own gradually. All against the pull of family back in the US, nine hours back in time and six thousand miles of flight. 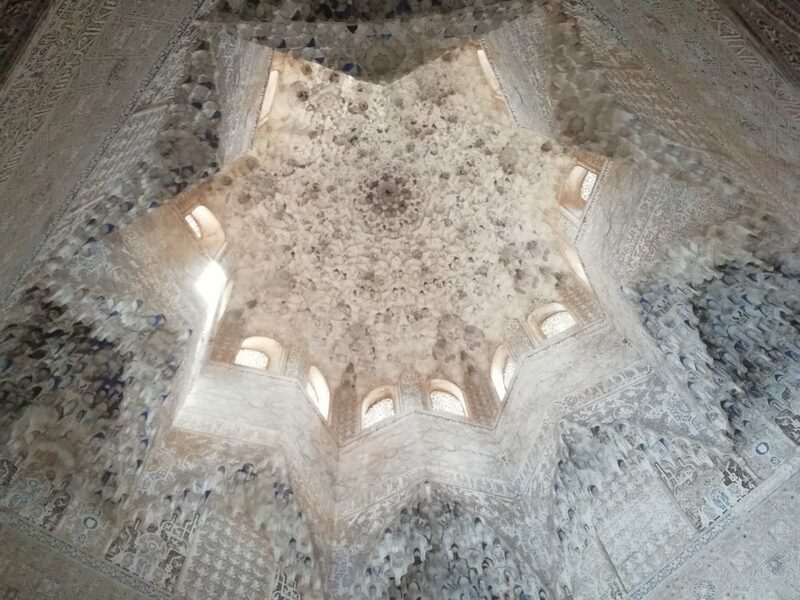 I think back over our trip through Portugal and Spain, places of such specificity that have already woven themselves into the repertoire of my dreams. 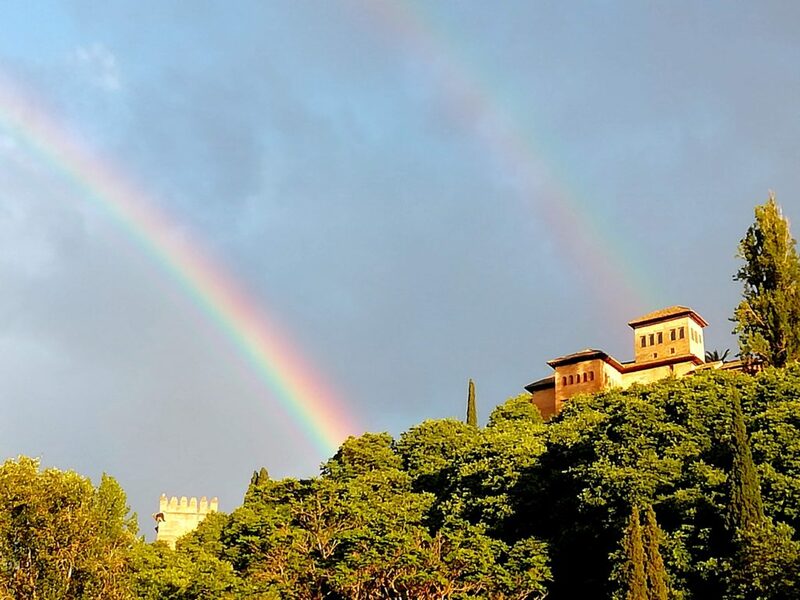 Granada stands out in its own way and Salema in another. They have become the background to the new rhythms of life in France. 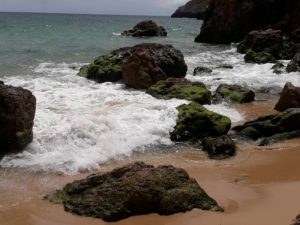 Salema. 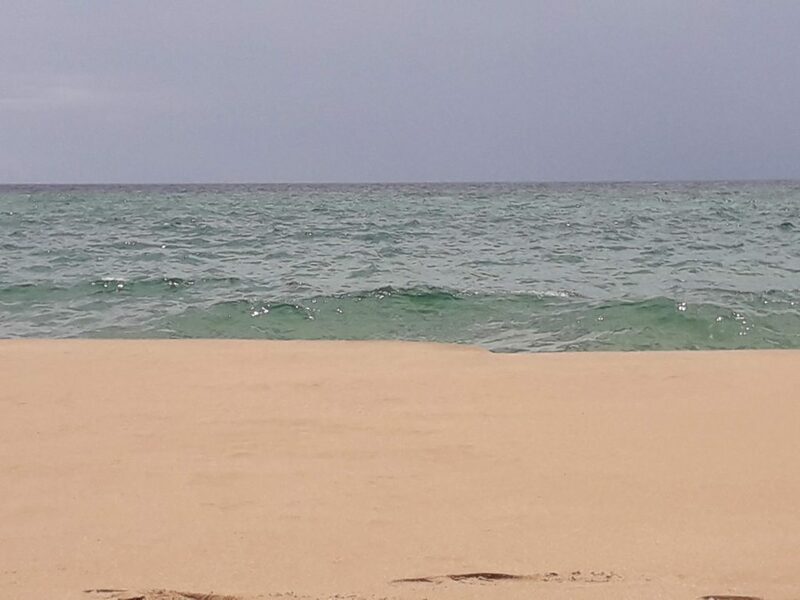 The transcendent color of the waters of the ocean, astonishingly clear, unlike anything I’d ever experienced in such a salty sea, always in motion. A transparent green that somehow lifted me with joy, with shades of light blue made even more etheric by the green. These things made their impression in the moment but, unlike the intense sensations of cities like Seville and Barcelona, they are stickier, their pathways hardened in my brain. The fragrances of the flowers in the town—the jasmine, the jacaranda, the roses, the honeysuckle—then the incredible, novel forms and colors of the unending varieties of wildflowers on the hills above the infinite expanse of the ocean. The clear delicious songs of birds with music every nerve in my body could taste. I stood for long moments listening, hoping the variations would go on forever. 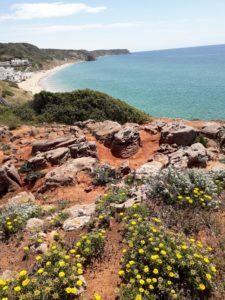 The wild beaches we hiked to through villages and along fields and woods. The warmth of the strengthening sun of the early summer. The delight in swimming on and on, back and forth through water cool and moving, playing with the waves. There were small disappointments, difficulties, but nothing that tarnishes the memories I visit whenever I like. 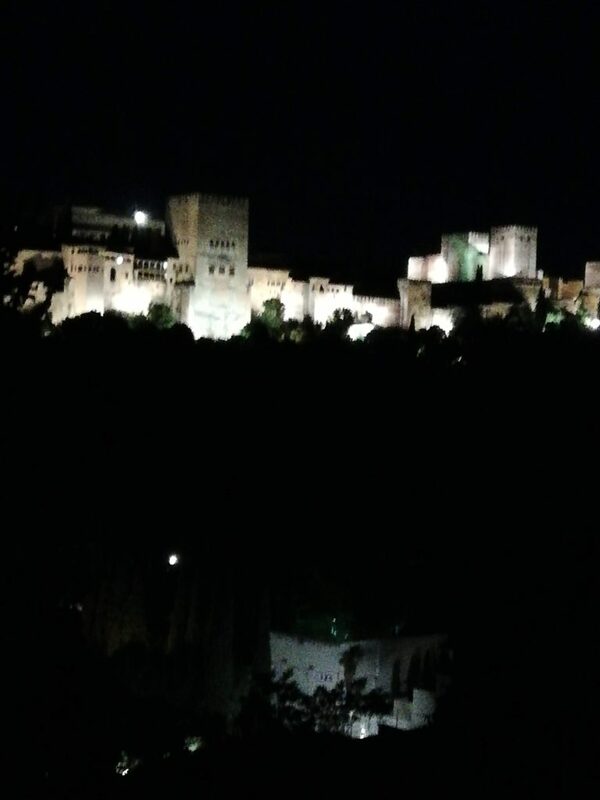 And then Granada. 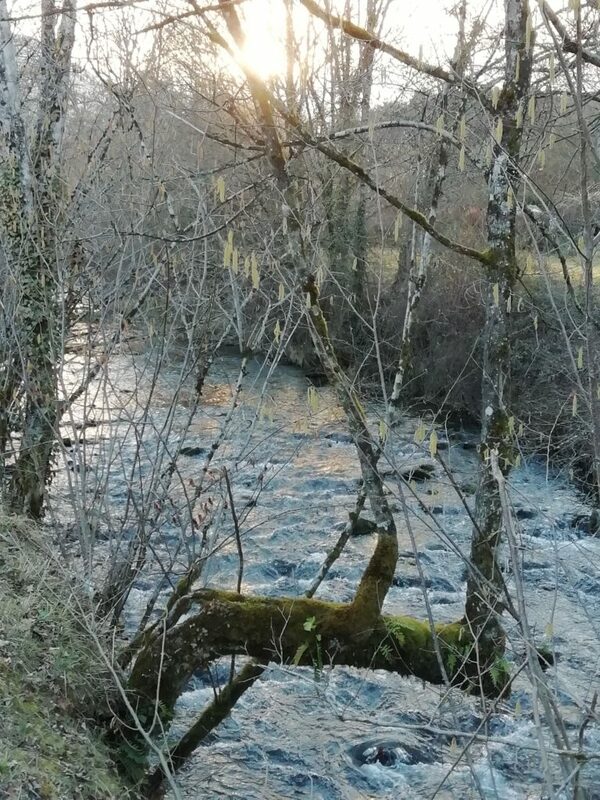 The Albeizin. There was something about the way the atmosphere itself seems to flow with a kind of airy fluidity. The sensation of the place seeped into the water of my cells, like the river that flows through the old town under the Alhambra, perching far above, un-ruined for me in memory by the ticket sales and the guards that chased us out like criminals before we had time to see the palace gardens and the haze over the surrounding mountains that seemed suspiciously like smog. The evening we arrived in Granada, pulling our suitcases behind us, day packs on our backs, deciphering the directions to the hostel, hot and tired from the trip from Seville, a youngish woman on a bicycle, her hair short and uncovered, her arms lithe, her shirt a wonderful shade of green, her skin satisfyingly browned, swerved down the cobbles of the hill, past the stone bridge over the little river past us, grinning and calling out, “Smile! You’re on vacation!” I thought, no, we’re not really, but thanks. Vacation means a break from something to which you eventually return. We’re not on that kind of break. This is what we are doing. This is it. 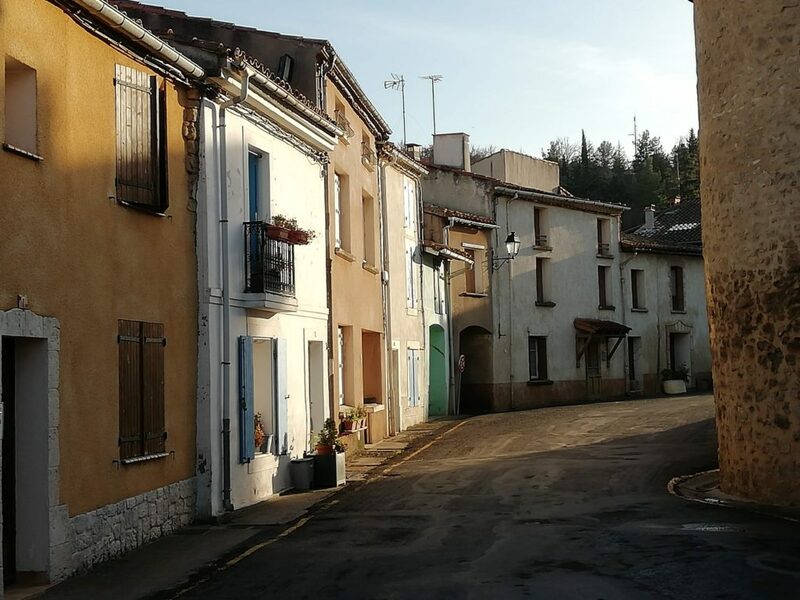 Here we are, somehow settling into the village of Fa, near the small town of Esperaza in the Department of L’Aude in south-central France. 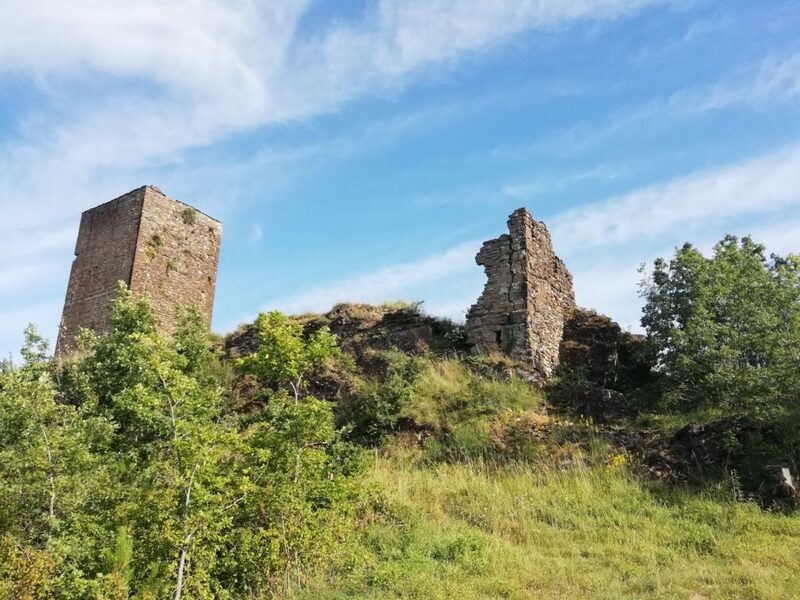 As you make your way around the surrounding countryside, you can always tell which way is south by orienting yourself to the mountains or to the tallest hills, the beginnings of the Pyrannees. We arrived on June 16th when there was still a cover of grey clouds, the days were cool and the locals were still complaining of the long, rainy spring. Our friend from three years ago (met through a connection to sustainable gardening on FaceBook, of all things, a woman originally from Malta who grew up between that island nation and another island nation–England–and moved here some twenty years ago) with a generosity only to be described as “genial (fr meaning fabulous, etc)”, put us up in the little stone cottage beside her pool. In the US, we would say it has two stories. 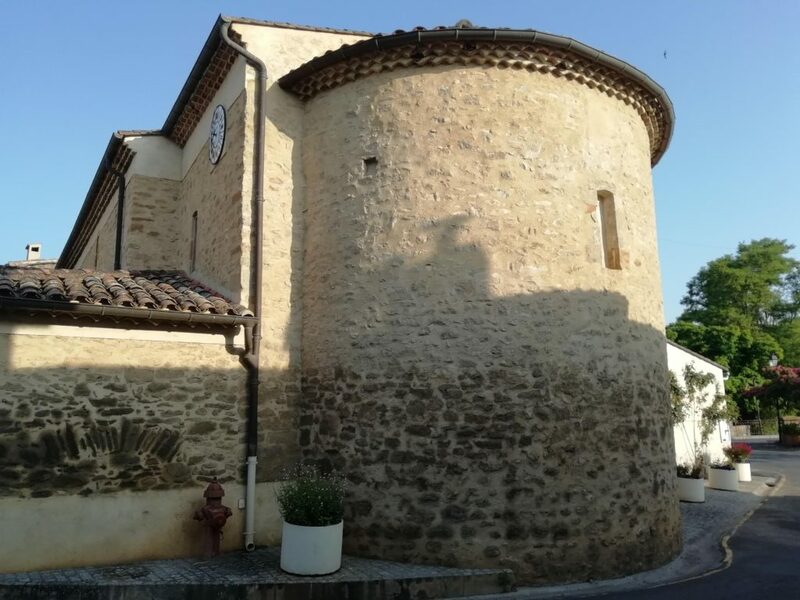 Here, we have a room on the “premier etage” with windows that open out on a view of the garden and the 14th Century stone church that forms the heart of the village. 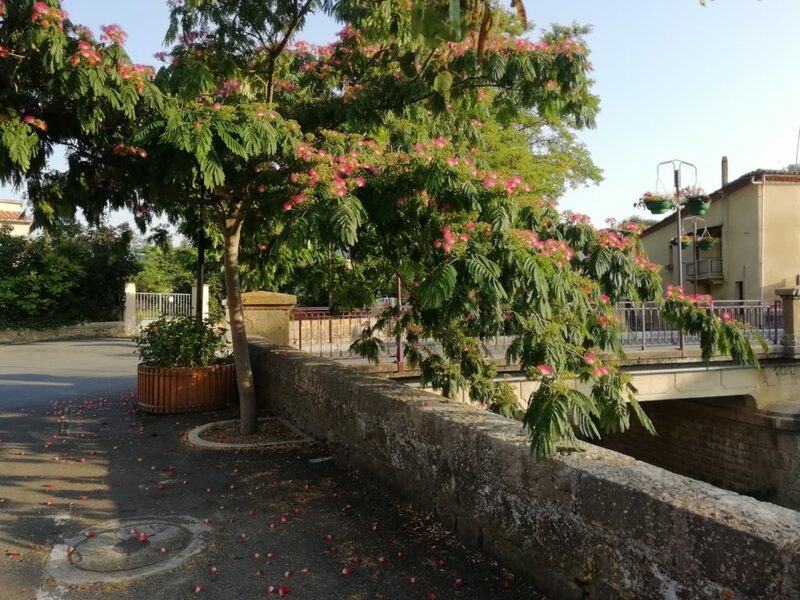 From our bed, we can see what’s happening in the little plaza around the church and hear the goings on from the one cafe restaurant in the village, just on the other side of the bridge over the River Aude, which runs like a big stream through the village. The sun came out a few days later and on this eastern side of the foothills the summer hit with with an uncommon sudden grinding of the gears. 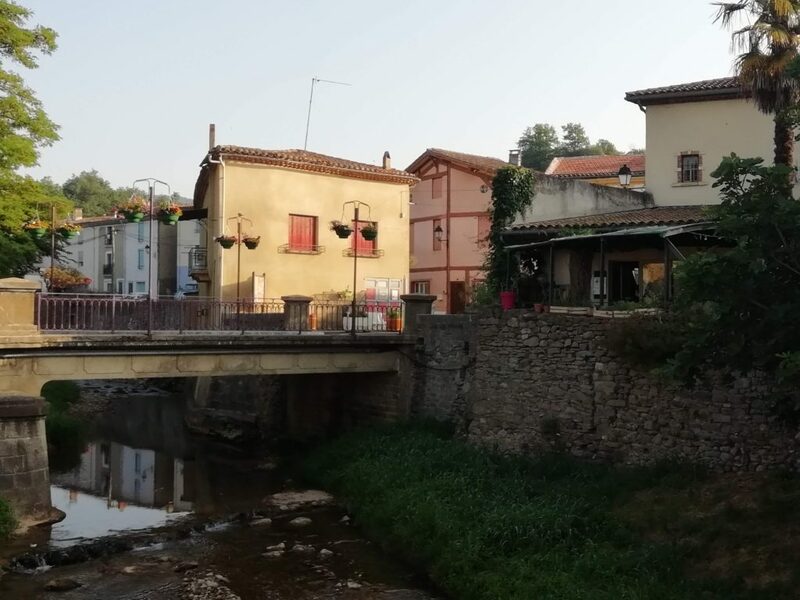 Where the River Aude widens, the cafes of the neighboring town of Esperaza filled. The petanque players came out in force on the graveled spots along the roads of the small towns and villages of the area, their silvery metal balls clanking and shining in the glinting sun of the late afternoon, murmurs of conversation and grunted exclamations of triumph or displeasure wafting by in puffs as we passed. Our work in our friend’s beautiful garden became almost impossible after noon, even in the relative shade. The mourning doves’ cooing and calling took on a new fever in the early morning and later afternoon. Life had shifted. School was still grinding on. Our host, not only a sustainable gardener but a teacher in the local schools, continued her work despite the shift in the weather. Students were sitting for their Bacs, teachers bored in the afternoon heat, questioning and questioning. The roses, in their full flower in the village gardens, were beginning to wilt around the edges. 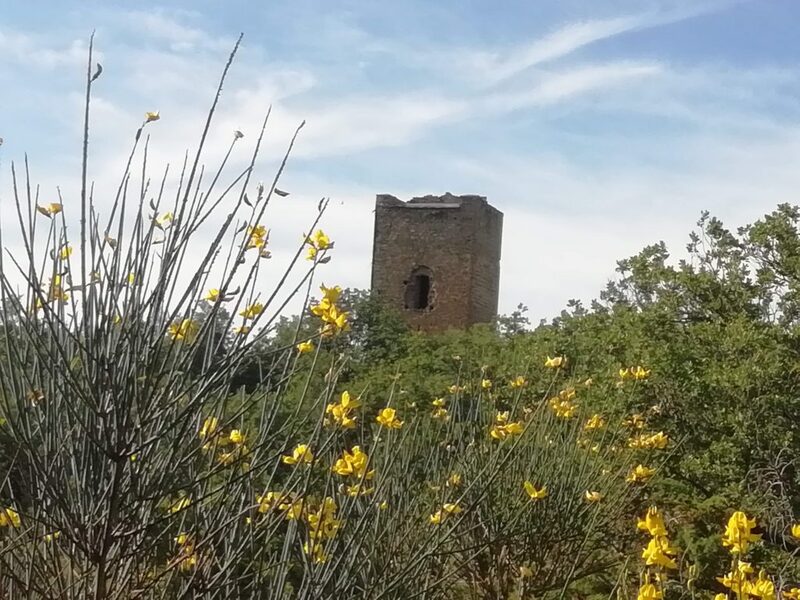 The herbs of St. James Day, the St. John’s Wort, the Feverfew, the Pis en Lit (Dandelions) were in their full ripeness, ready to be gathered in the fields and forest edges. On Thursday evening the 21st of June, the eve of Summer Solstice, festivals of music took place all over France. In countless cities, towns and villages, local people had been practicing and preparing for the event. In Fa, on the green common space by the river, a big tent was set up, beer and wine and food was served and almost everyone from the village and the two or three that make up the rest of the Commune were present for some part of the night. In addition to our hosts, we’d met several of the local people, some French, some ex-pats from England and Germany, at the Cafe de Fa in the village. 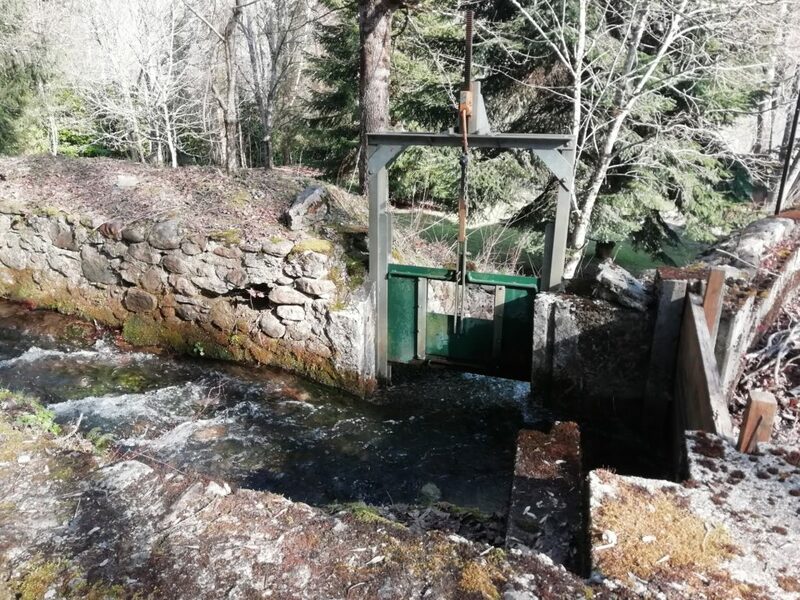 It sits right at the turn off from the main road that runs through the village, right at the bridge over the river that divides the upper and lower village. 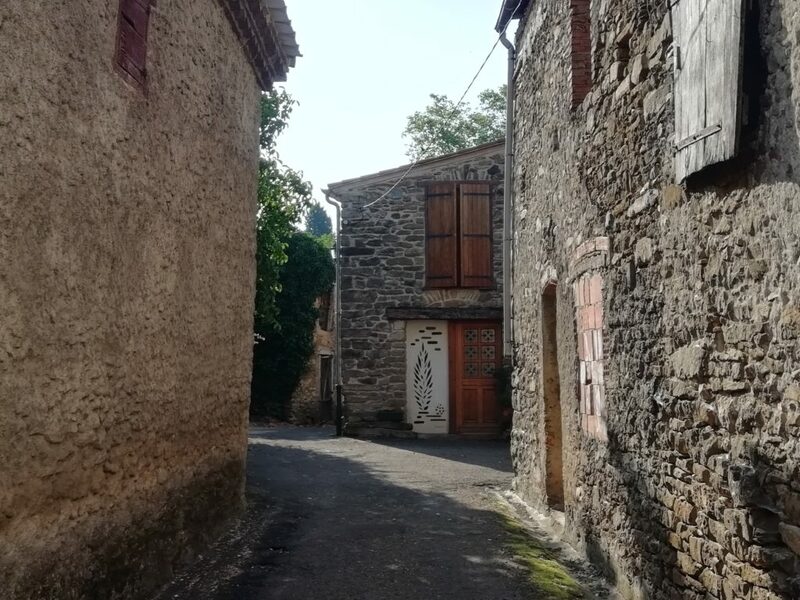 Old village houses line the main road, as they do in every village in this region, their wooden doors painted in various shades of blue and red and brown, their wooden shutters often closed to keep out noise and heat. There, right at the turn off to the bridge where large pots of flowers bloom, a young couple have fairly recently taken over the old restaurant. They moved into an old barn up the village road where they are making the most of their youth and energy to fix it up and create something of beauty and simplicity. They are using local food and herbs and cooking dishes of the region and dishes of their own creation. 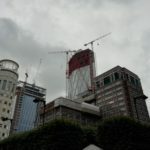 They are making a go of catering to both the expats and the locals while still attracting the flow of tourists that come in the summer. Both speak English fairly well. 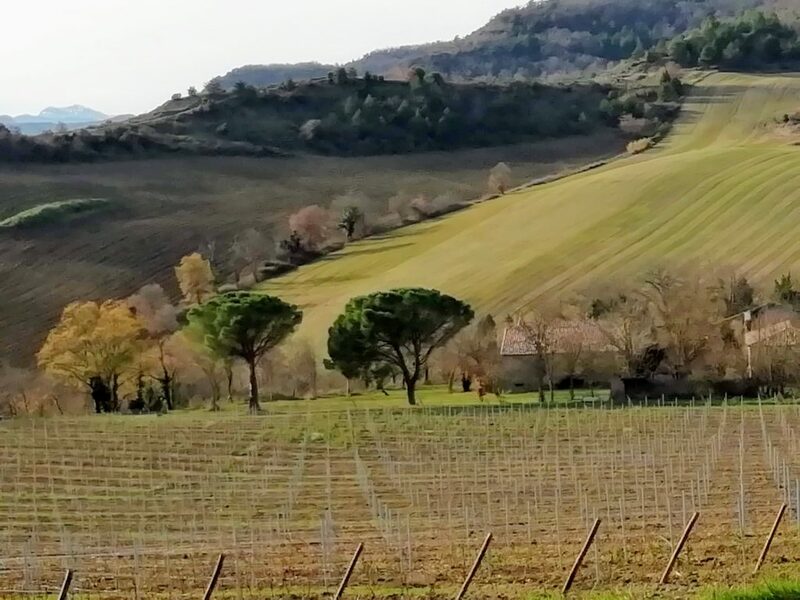 They work hard and know that the relationships they make with the village and their customers are just as important, if not more so, than the quality of food, wine and service. They visit with us. They know most of the people coming and going. They know their predilections. They open in the mornings for coffee, some pastries and a few special items. Sometimes they close for a bit and then re-open around noon for lunch. They close around 2:30 and open for dinner again around 7:00. They are closed Mondays and Tuesdays. During the summer, they have live music on some Friday nights, heard by most of the village until midnight. On Bastille Day, there will host someone who will speak about the history of the village, a long one. There is no schedule of opening times on the door. You have to know. We had already watched several World Cup games with some of the locals who still have an interest in football and a few of the ex-pats. The people of the area are fairly tepid about Le Foot. It is an area crazy for rugby. At the Restaurant de Fa they couldn’t show some of the games since the broadcast package that contains all the World Cup games was prohibitively expensive for a small village restaurant. But when there were games to be seen there was still a mixed gathering in the indoor seating, drinking Estrella beer from Spain, glasses of wine or Syrop with water, chatting during the boring parts and cheering and commenting when things got exciting. People came and went, kissing on both cheeks as they entered, greeting ‘Manu, the owner, Julia coming and going with orders for the customers outside by the river. We saw them all down by the river that night, many dressed up incongruously in colorful clothes made of African materials. I’m still mystified by much of the symbolism of what I see, just as I am by a language whose delicacies (and indelicacies) of usage I’ll be deciphering for some time to come. As we walked down to the site of the festival in the common area in a shady spot by the river, past the big communal recycle bins, a group of men and women dressed in bright green homemade tunics were warming up in formation, faces theatrically serious and blank, with their hand drums, sticks and shakers, their conductor instructing them with her arcane hand signals. We bought our wine and beer at the stand under the big shelter, used for village parking on other days, paid deposits for the plastic cups, and watched as the troop in green started up, playing and dancing like some small, basic version of the Indian Bands at Mardi Gras. 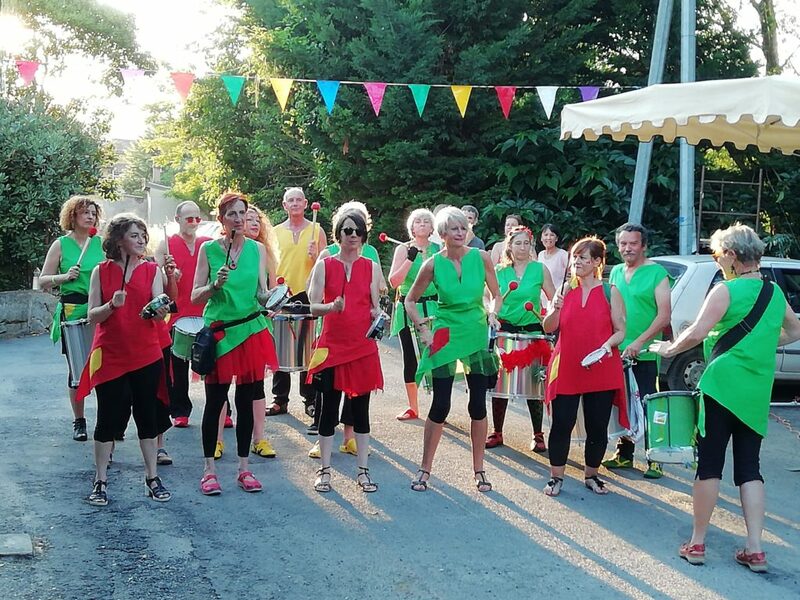 They went on for what seemed an hour, people, men and women, some almost as old as we are, probable transplants to L’Aude, dancing wildly and beautifully to the endlessly shifting beat. The whole thing, performance and participation, was like something from another time, another space, some of it ancient, some the current reiteration of the ’60s, grown right from this tiny village, a mix of ex-pats, French from other parts and natives of Fa, an exotic stew, with sophisticated flavors and a rich broth. From time to time it seemed that one or two of the elders of the village, those who sit on the benches near the bridge in the evening, came to walk through or sit and watch. They know all about it. Their village is still here. After what seemed an exhausting length of time, the band somehow still seemed fresh and ready to continue all night. And after other groups played in the tent, there they were again, ready for another round, the dancers from the village following right behind. 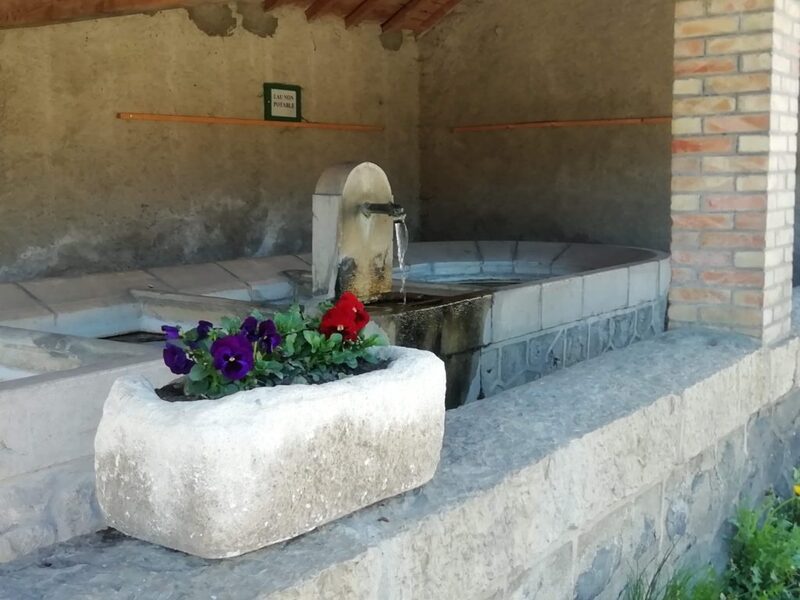 The church bells had struck eleven times as we walked the short distance back to our little stone house beside our friend’s little swimming pool. The night still had some good heat left in it as we passed the stone church, the three-quarter moon swaying in the dark blue sky above the bell tower, the planet Venus as bright as an approaching airplane as we walked towards the west where it gleamed in the vastness. We opened the big metal gates and made our way across the grass now wet with dew to our little cottage. Through our wide-open windows, we heard the music and the voices of the festive crowd well into the night. Our host’s teenage boys and their friends wandered through the garden and messed around on the trampoline well after we’d gone to bed, the whole village their playground. I woke briefly as the bells stuck twice in the usual quiet of the sleeping village. 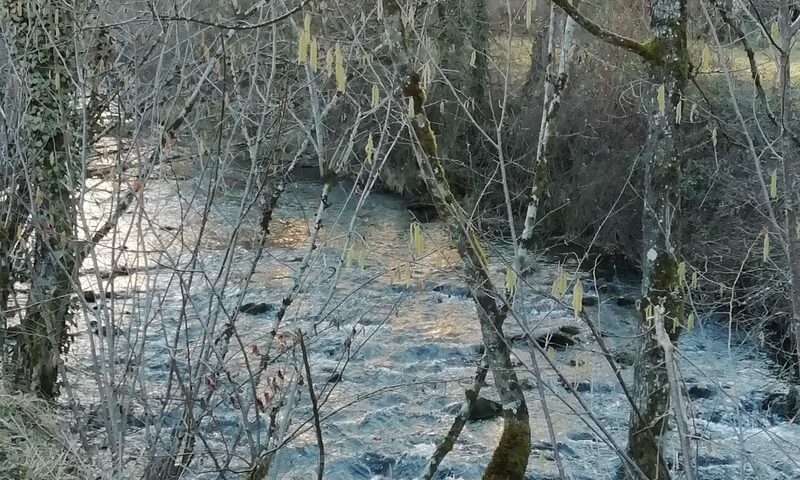 Their sound, the first peal still startling to me, like a metal pipe clanging to the ground, connected me immediately to the place where I am, where I sleep and begin my days. I was not in our little apartment in Salema, Portugal, with a view of the ocean. I was not in Porto where we slept with a window facing the tiled roofs of houses, spread out to the river beyond. I was not in our tiny apartment in Lisbon where perhaps the man with the handcart might be coming down the street at that hour to collect the bags of garbage left out on the sides of the street. It could be Evora, with the church across from our room in the hostel, but there the peals of the bells were higher and more distant. I couldn’t be our room in Lagos where the streets were quiet until 6 am. It couldn’t be Faro, where it might have been the sound of some rowdy, cheering crowd, celebrating some victory as they made their way home at last that woke me. 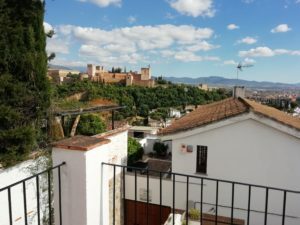 It couldn’t be our room in a hostel in the Albeizin in the magical city of Granada, where Italian students might have woken me with their late night operatic melodramas as we slept in the shadow of the Alhambra. 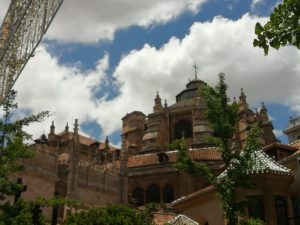 It couldn’t have been Madrid, where our open window had a view of the walls of the surrounding buildings and the only noise was that of other guests coming back down the hallway. It couldn’t have been Barcelona, where there was silence until the early morning when the metro began to rumble from far down below us in its underground haunts. Even as they’ve begun to recede into the background of my mind where, in the course of life’s preoccupations, they may no longer register in my consciousness, the peals of these bells have now begun to regulate the rhythm of my days. At two am they tell me, “Go back to sleep. There’s plenty of time.” At 7 am my body now responds with “Yes, okay, it’s time. Up now,” and if I hesitate, there’s the repetition at 7:05 or so, as with the peals at all the hours, in case I missed it. At noon, by the second repetition and certainly by the musical peal of the midi hour, my stomach has begun to signal that it’s time to stop for lunch. Within this rhythm, the heat of the day seems to almost force me to lie down for a nap after lunch. 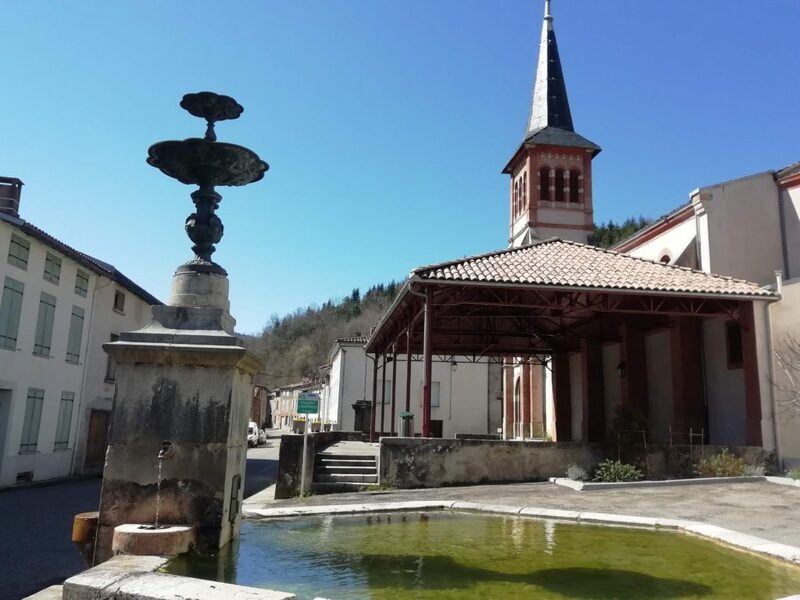 Many mornings we leave the village by 10 am to drive around the neighboring department of Ariege where we hope to settle. Or, if we’re lucky, we drive to meet our agence d’immobilier so that he can show us some properties. Then, once we’re far from our apartment in Fa, we have learned if we wait until 2:30 or so when we’re really hungry, every place that serves food of any substance is closed. 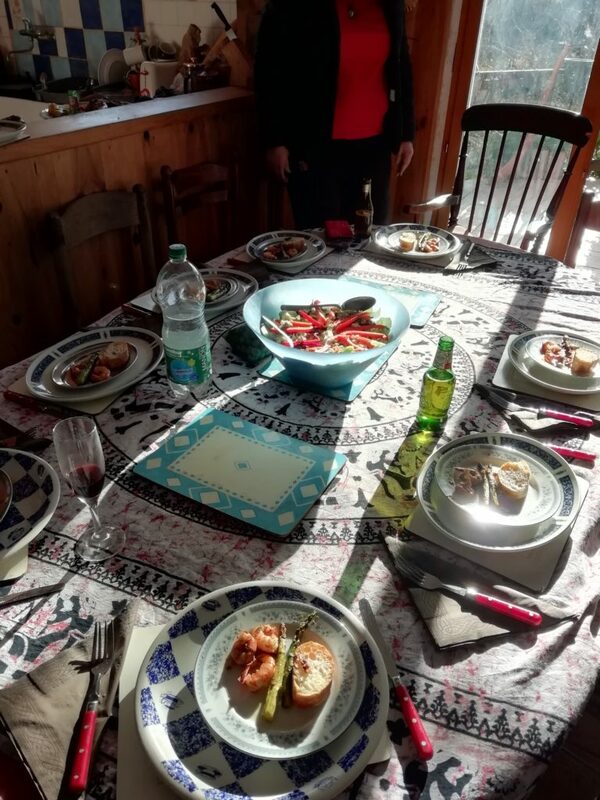 If we stop for lunch between noon and two at a real restaurant, the ones with the fabulous food, we will be there for a couple of hours, drinking beer and wine, waiting for our food and then waiting for l’addition (unless we make a point to the servers or the maitre d’). So we’ve learned to take along a picnic and stop for a beer somewhere at a cafe. I’m getting better and better at taking my turn driving our rented standard shift Citroen through the narrow streets of the countless villages and the twisting turning mountain roads where cars don’t always stay in their lanes around the curves. When we stop to look around at a village or order a cafe au lait or watch one of the World Cup matches at a bar, I chat up the host and usually one or two of the customers, practicing my French or reverting to English when it turns out, as it often does, that they are ex-pats or have spent time in England or the US. My French is improving, but slowly. It reminds me a bit of when I was 18 and travelling with my friend Alice, both of us in France for the first time after studying French in school for many years. It was as if my sense of who I am was veiled, my ability to communicate my experience of things passed through a thick filter that left people with only the gross residue of my being, rather than the subtleties that make me who I am. It took about a month of growing friendships and an increasing sense of what it sounded like to communicate in French, what it looked like, how it even tasted and smelled to use these words, this music, before more pieces of my sense of self began to return. Since my sense of self is quite a bit more formed by this point in life, it’s not so dramatic this time ’round. Now the largest frustration is missing huge chunks of the conversations going on around me, missing out on all this stuff, the tissue and complexity of information and interaction that would give me a key to all these humans, to the way they see the same things I see in some different way. I am gliding over the surface, curious, but my interior sense is untouched. And I’m surrounded by people whose own sense of self seems pretty established. It doesn’t seem to be a concern. And they like that they live here. They don’t seem restless. 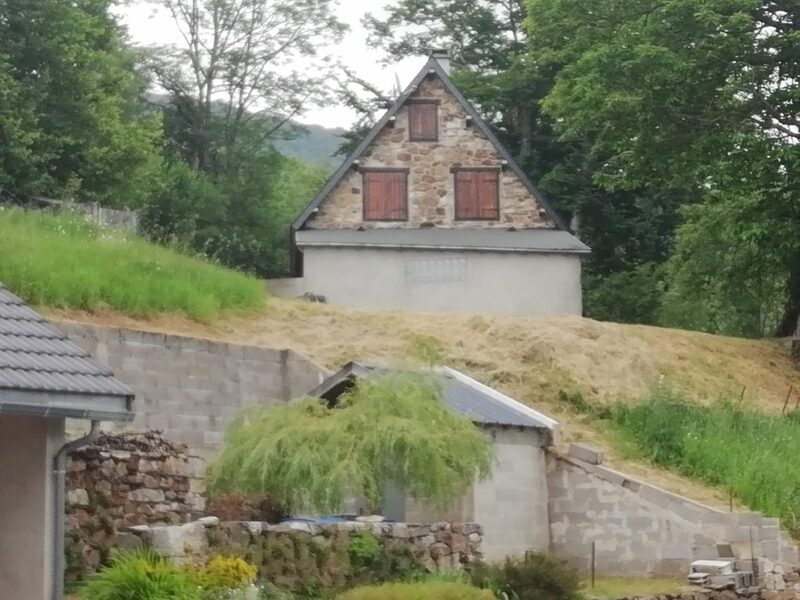 For the most part, although they see the imperfections clearly, they appreciate what they have, both by being French and by living in the part of the country where village life and country life is still real. They seem secure in a sense of what’s important—community, family, taking care of each other, living within certain means, maintaining a rhythm in life. This could all be an illusion they create for the daily stage of a small village but if so, they’re good at it. I find I like it. I’m sure that as I get to know them better, their insecurities, their prejudices, their worries, the stresses of divorce, of relationships on the job, in the village, with their spouses and children, their frustration and anger with their government and the world situation, will emerge, just as it does with all humans. Here, they seem to know that all this is in fact, part of being a human, part of life everywhere on the planet and at every time. Although it is an outrage, it doesn’t seem to be surprising. Life goes on. Watch the game. 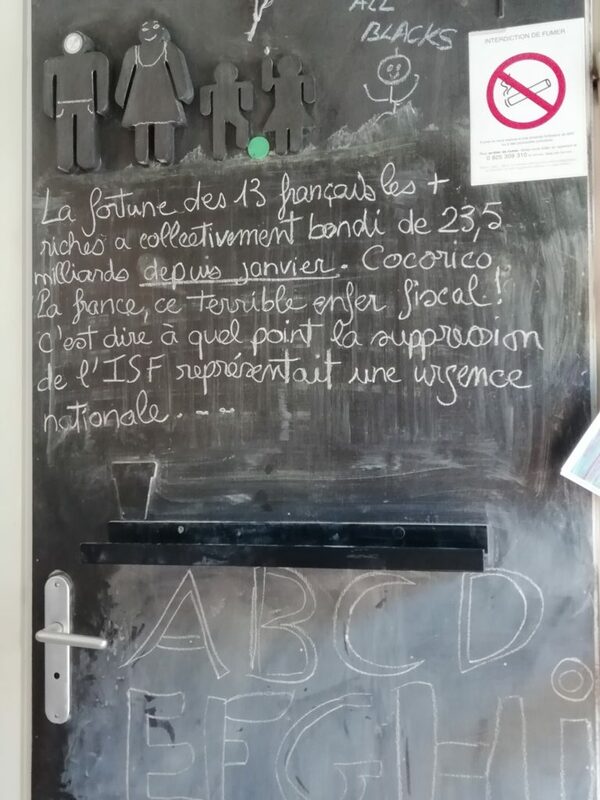 As a man wrote on the chalkboard of the Cafe de Fa, “Cocorico, la France!” “The coq is crowing! Wake up France!” Yes, but they are already more awake to the extremity of our human situation than the Americans, where the urgency gets more extreme by the moment. Many French people believed that the results of our last election would cause a general uprising and a re-creation of our democracy. Yes, that was the possibility. Is it still? Cocorico Etats-Unis! Our apartment in Fa. Bienvenue!